Recently received this photo from a satisfied customer. Ace x Jelene pup born mid July. 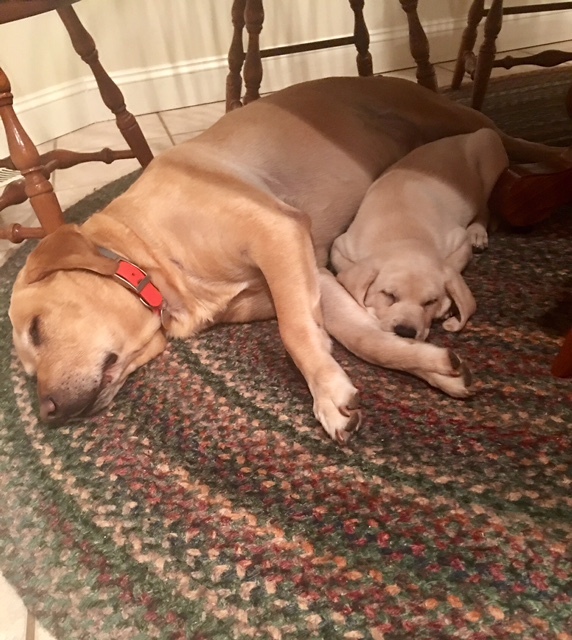 Subject: Thank you & a puppy for my parents? The puppy we got from you is wonderful. We've named her Luna (Rimi x Otto litter) and she's a very good girl - a fast learner and so gentle with our daughter. My parents lost their dog a few months ago and have fallen in love with Luna. They can't have her, but I told them I'd reach out to you to see if you had any availability in upcoming litters. 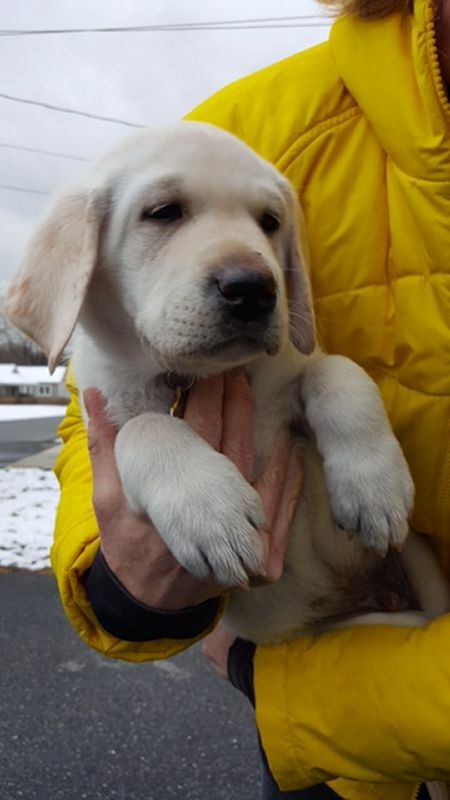 I saw on your website there might be another yellow litter and maybe a black/chocolate litter coming up? Please let me know! A text or call is fine too. Thanks so much for all the pictures and video. We're all getting more excited every day. 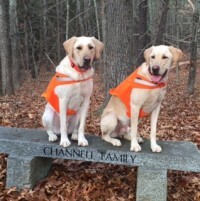 We really appreciate the loving care you both give them raising them they really become great retrievers and pets. A client who purchased a Poppi/Otto yellow male from the September 2017 litter wanted the new clients to see her pup now 10 months old. His name is Bonez. 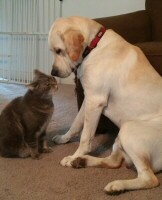 Attached is a photo of Jack with our cat Dash, his best friend. Jack has such a great disposition. Both of our cats LOVE him! Rylee from Hunter/Seeker 5/2/16 continues to be the joy of our life. Every now and then I check your website to see what new puppies you have and I see that you and Levin are retiring to start traveling. We are very happy for you and wish you the best. Are you also done with the peaches? We kept hoping to stop by on our way to our home on Virginia's Eastern Shore to buy peaches and show you Rylee but it never worked out. Last year during my company's financial audit, I was chatting with one of the auditors about labs as he has one also. 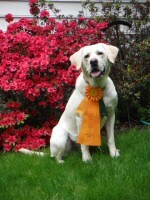 I described how long I researched and finally found a wonderful couple who breeds them in Delaware just south of Dover. He goes do they grow peaches also. I said yes. 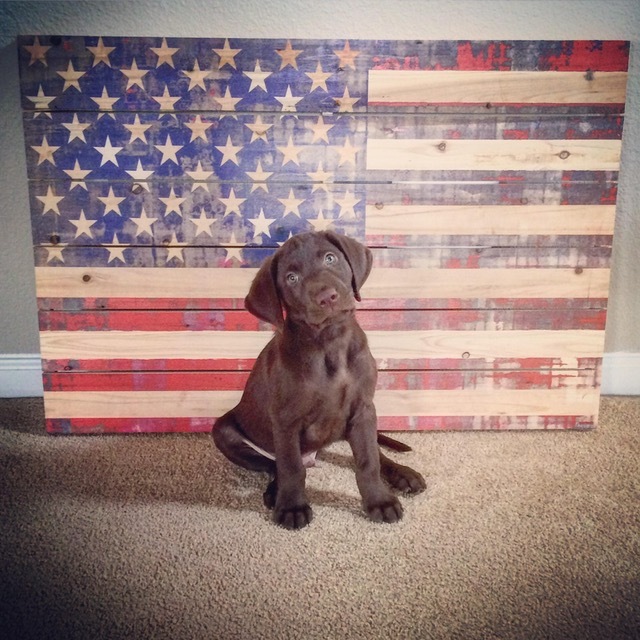 Their chocolate lab is from the May 2014 Hunter/Mocha litter. It is truly a small world. Thank you again for breeding such loving puppies. 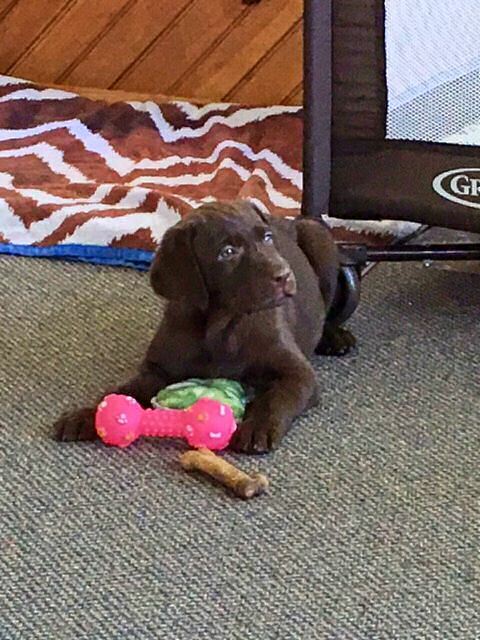 It has been 2 years since when we got Saba (litter 1/1/2016 Mocha & Hunter) from you and we wanted to let you know that she has been a blessing for us ? not only is she wonderful, but she is obedient and just loves being with us. 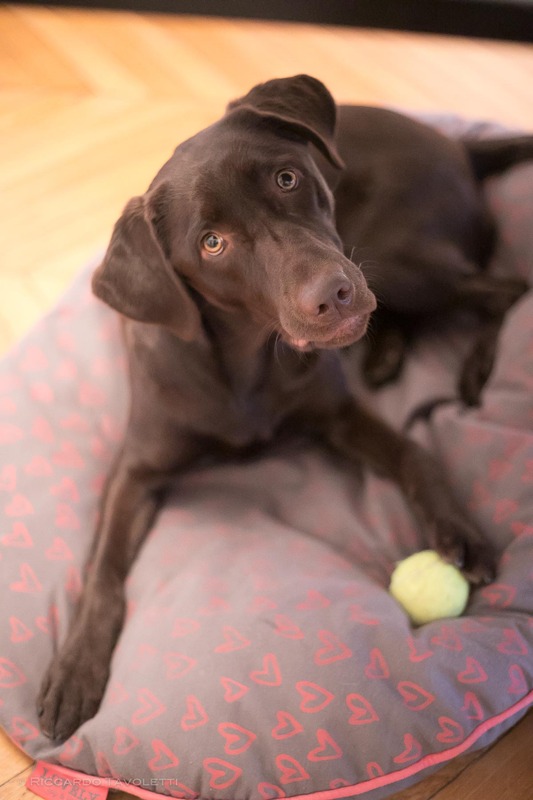 We now live in Paris, France and there has not been one day that someone approached us to congratulate us for our fantastic chocolate lab and to ask us where we found her. If we were still in the US we would surely come and get another puppy!! PS she has a personal Instagram account @Saba_parisienne ? check her out! 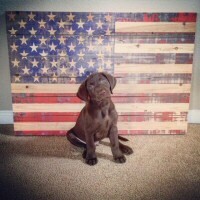 What a smart pup we have!! While she is trying to eat everything in sight, we have had just 1 accident in the house. She has already started going to the door to go out!! Great bloodline! 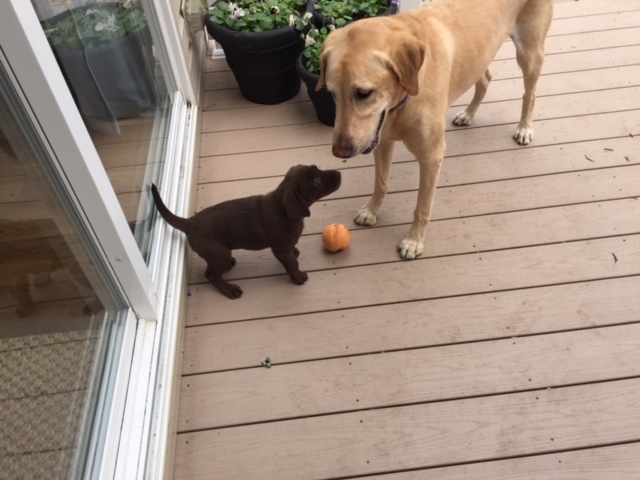 And, Pretzel and our older boy Tripp are figuring things out nicely!! We couldn't be happier. 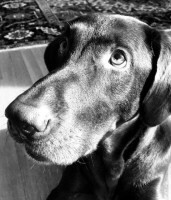 It's been a long time since we updated you on Mojo (Missy X Tank, 2/22/08) who just had his tenth birthday last week. 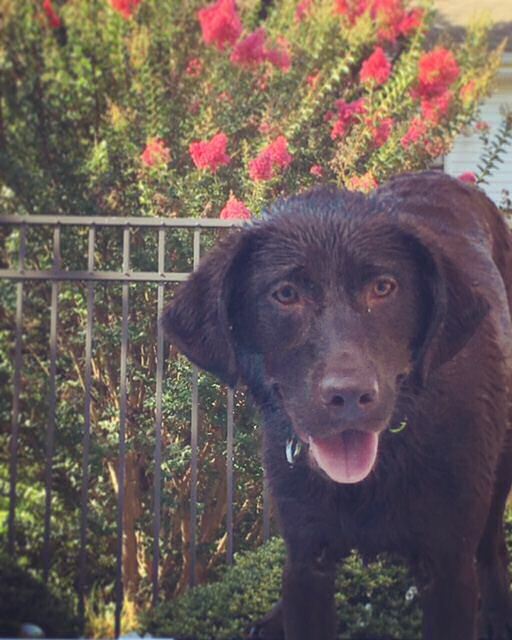 He made quite a name for himself in DockDogs in his younger years, but now he just relaxes as he swims and jumps into the backyard pool for his Frisbee. As long as he?s got one in his mouth, he's a happy boy. 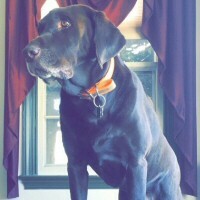 He and Zelda (Seeker X Hunter, 7/17/13), our other PeachesAndPups black Lab, get along great and are always playing or messing with each other. They've got very different personalities (and she's as small as he is big), but they fit each other like hat & glove. Attached are some Dock Diving shots of Mojo over the years and others of Zelda and him. They have made our lives unbelievably richer and more wonderful than we could have ever imagined. 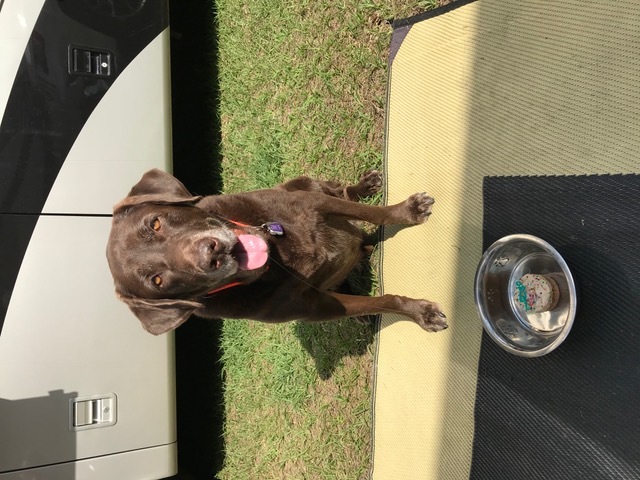 Willie (Missy and Tank) celebrating his 10th Birthday?????? He was wondering how his brothers and sisters are doing and hope they got cupcakes from their humans too! On Milo's fifth birthday we are thinking of you and what a blessing it has been to have Milo in our family. He still gets lots of remarks walking in Manhattan about being a handsome dark chocolate Lab. 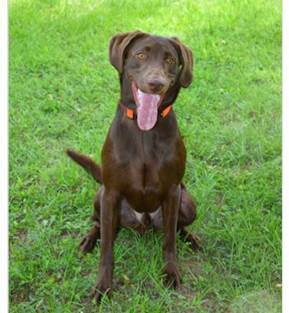 Hunter will be proud to know one of his pups is an accomplished city rat hunter with several catches to his name. The last catch landed Milo in Heart of Chelsea animal hospital to get a stitch on the lip, but fortunately he fully recovered. Since then he walks with a muzzle. At age five he is still very playful and most importantly he is very loving and protective of our 3.5 year old son. How are Ruby and Hunter? 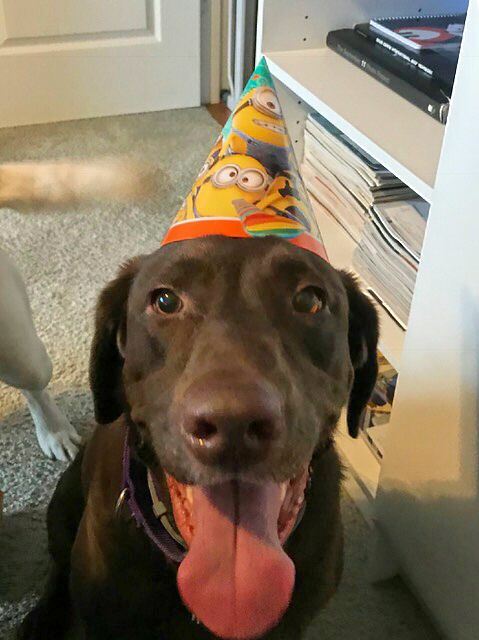 Turns 5 today (Hunter / Ruby). Smartest, prettiest girl ever! Thank you so much for this amazing dog. 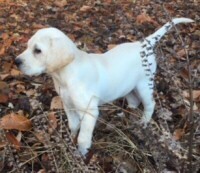 Here is a picture of Archer, a Poppi/Otto yellow male born 9/22/17. My family and I are thinking of you and can't thank you enough to bring this little guy into our lives! Here's a couple of pictures we have taken throughout the last couple of months with him! His name is Miles and he weighs about 35 pounds, and he's giving us all the love and snuggles we so dearly adore!! 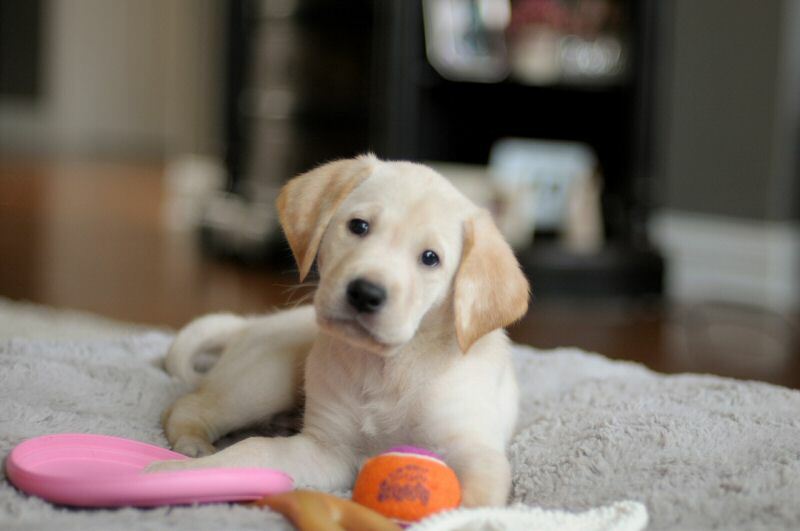 We keep checking in on your website, Peaches and Pups, and love seeing pictures of his brothers and sisters! We hope you are both doing well! Miles picture 2. Happy New Year! 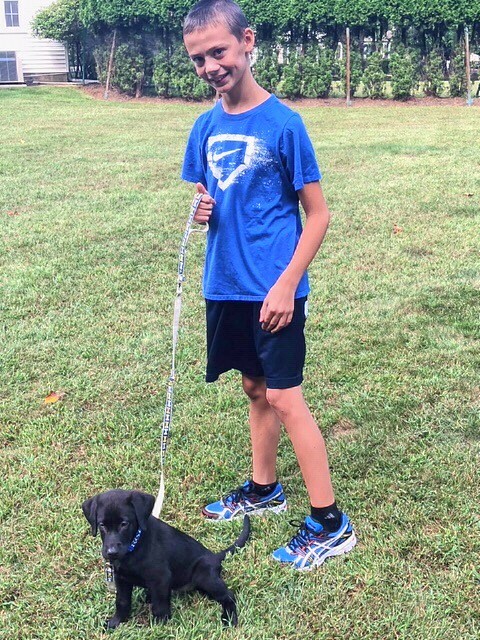 We just wanted to give you an update on Archer! We love him so much, we could not have asked for a better first puppy together. He had no problem adjusting, he is so obedient, and he is incredibly smart! 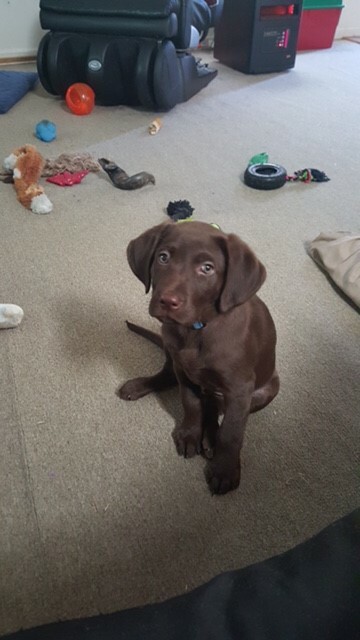 He is about 30 lbs now and growing quickly! He loves cuddling and exploring outside, and he can never have enough sticks. 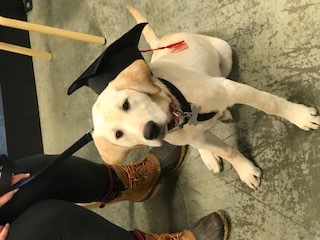 He passed his first puppy class with flying colors and is learning new tricks everyday. We can?t thank you enough for our wonderful puppy. 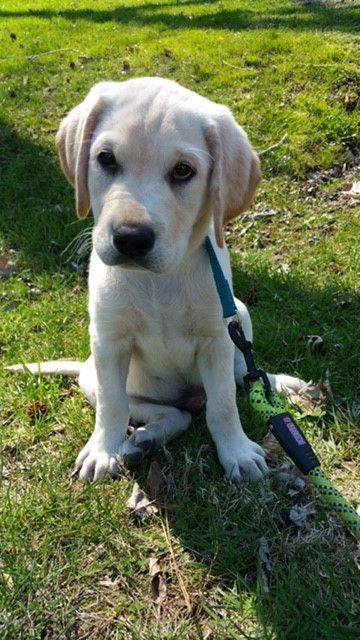 We have attached some pictures of Archer. Archer picture 2. Hope you and Levin are doing well. Just wanted to give you both an update on Rocky. He just received his booster shot and weighed in at 18lbs. 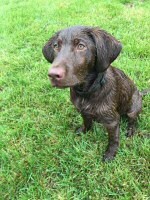 We are so happy with Rocky, he is very lovable, smart and really energetic. He loves to sleep in his crate and puts himself to bed all the time. 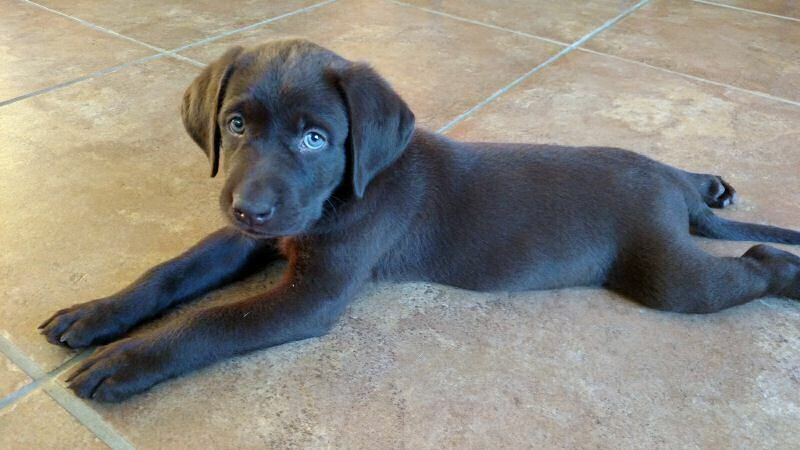 He already knows how to sit & come on command or whistle. He loves our older dog Rebel, we call him his shadow. 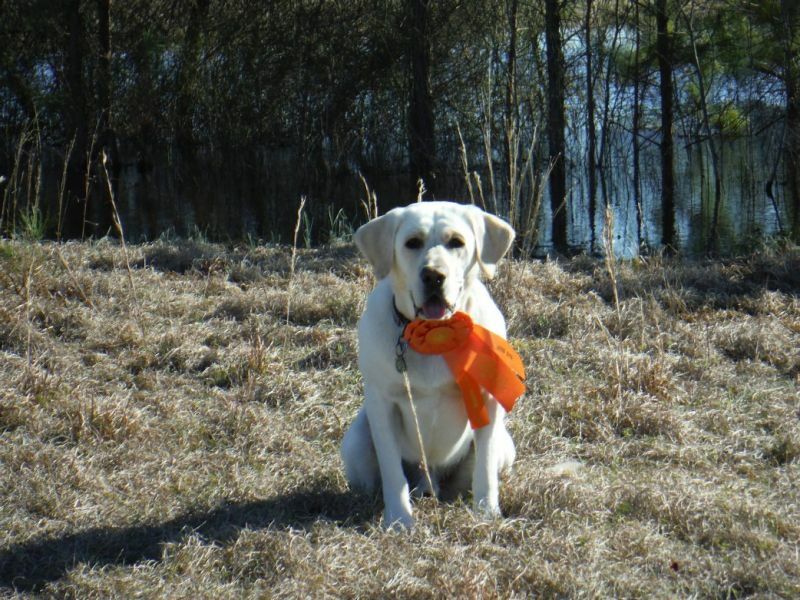 Rebel has already taught him how to retrieve a bumper, he loves it almost as much as eating. Here are a few pictures, thanks again for everything! We are all in love with our new addition. See a Rocky and Rebel picture. Just wanted to give you a quick update on Max! 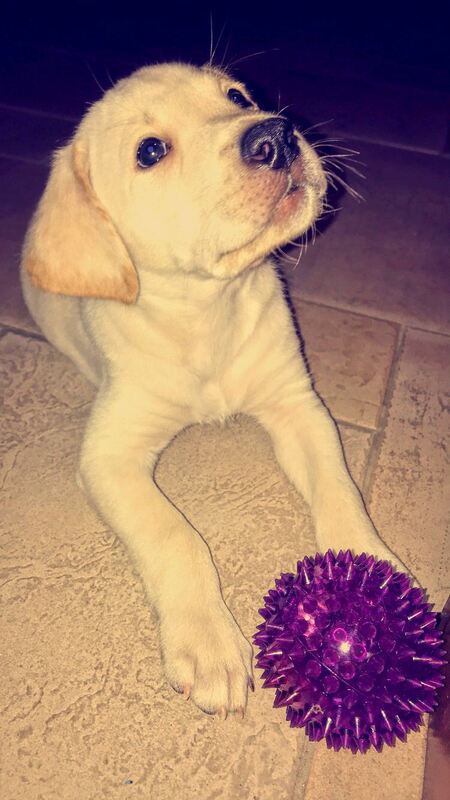 He's an amazing puppy! He has settled in very nicely and is really a perfect pup! Since the very first night in his crate, he hasn't cried one bit. He actually wakes up before we do and he just plays quietly until he sees us wake up! He's such a good boy! Now, the first day I returned to work, he wasn't so happy in his crate, but I'm hoping that part gets easier for him. I am lucky to be able to come home during my lunchtime, so it does give him a break. 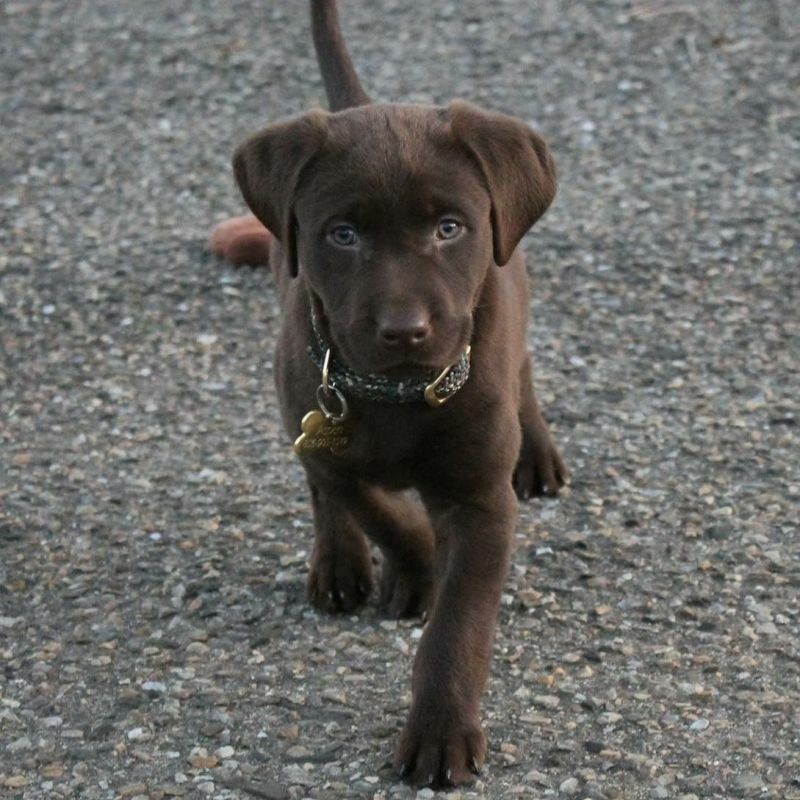 Thanks again for breeding a wonderful puppy! 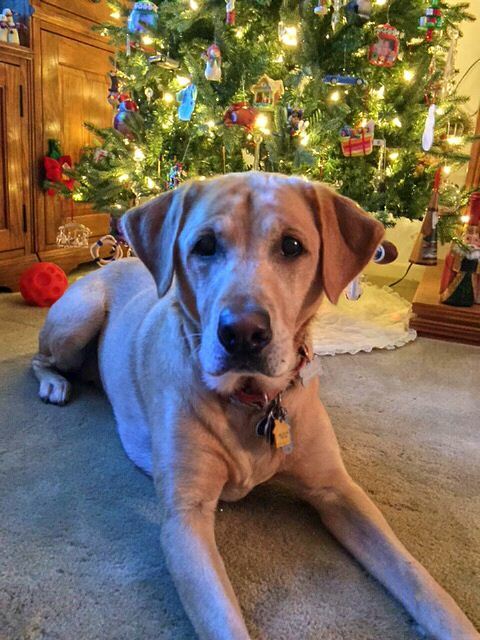 After losing our beloved Baxter that we got from you over 12 years ago, we knew that getting Max from you was the only way to go! Now, I did have 2 quick questions for you... How much did you feed the puppies daily? We are feeding Max 3 times a day, but he seems likes he's starving! Beaver dam recommends 3/4's a day, but I'm wondering if we should feed more? Hi Nancy! Just wanted to give you an update on Kona. She's 8 months now and is already an incredible dog! She's fit into our lives so well. She LOVES to cuddle up on the couch with us, chase after balls, play tug of war, and of course go swimming (her favorite!) For being 8 months old she is so well behaved and has the sweetest personality. We couldn't be happier! On another note, we were wondering if you had any information on Bonnie? 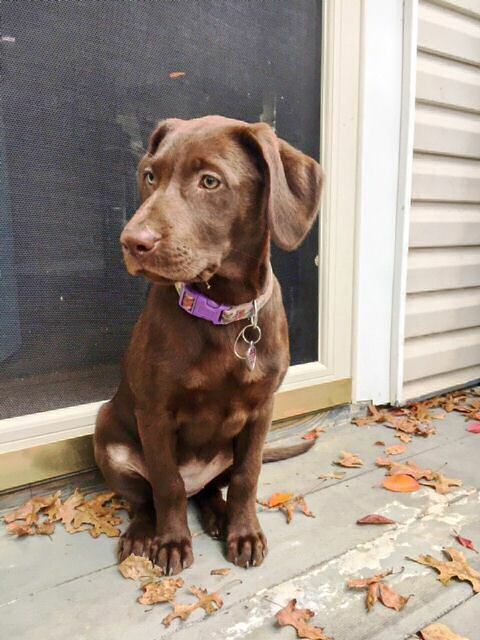 Kona is now 50 lbs and we were just wondering how big she will get? 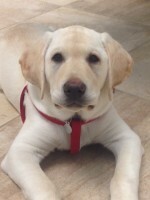 The vet thinks she will be a smaller lab (ok with us!). Thanks again for giving us such a wonderful pup! Hope you're doing well! I wanted to send you an update about Brew's progress. He is doing amazing and I couldn't ask for a better dog. He has so much drive, but is also very trainable. The trainer I use is also a police dog trainer. 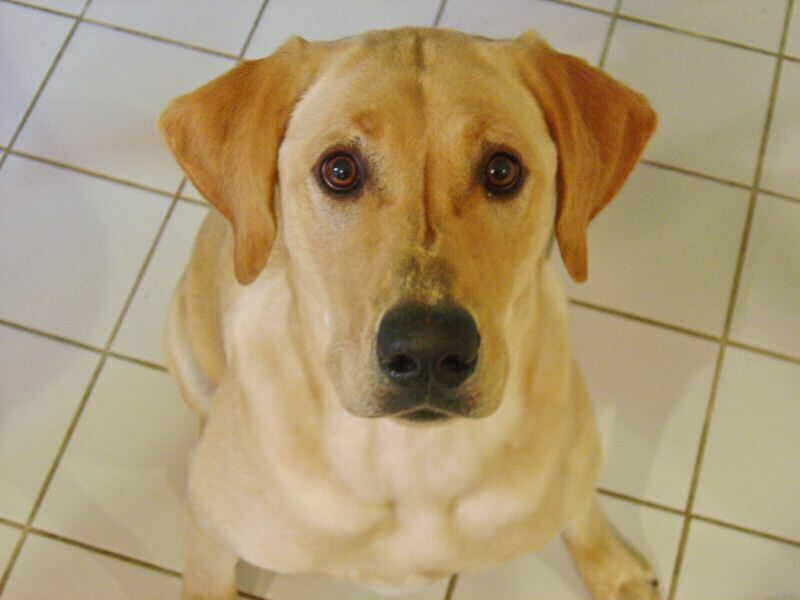 He calls Brew a "lab in a malinois skin" because of his drive and trainability. 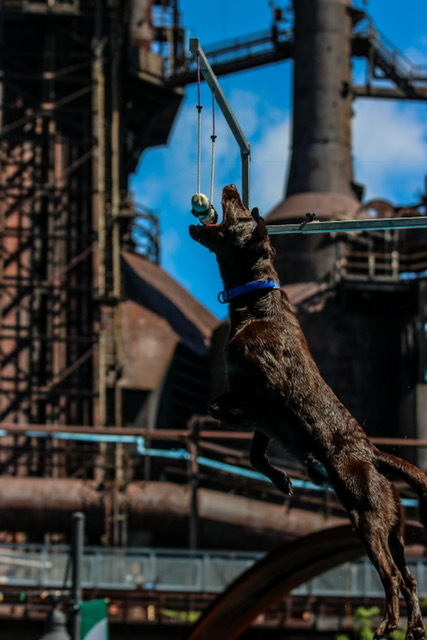 He currently does upland hunting and competes in dock jumping, disc dogs, and lure coursing. 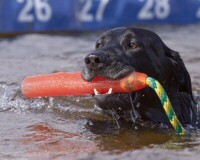 At not even 2 years of age, he is making a name for himself in DockDogs. 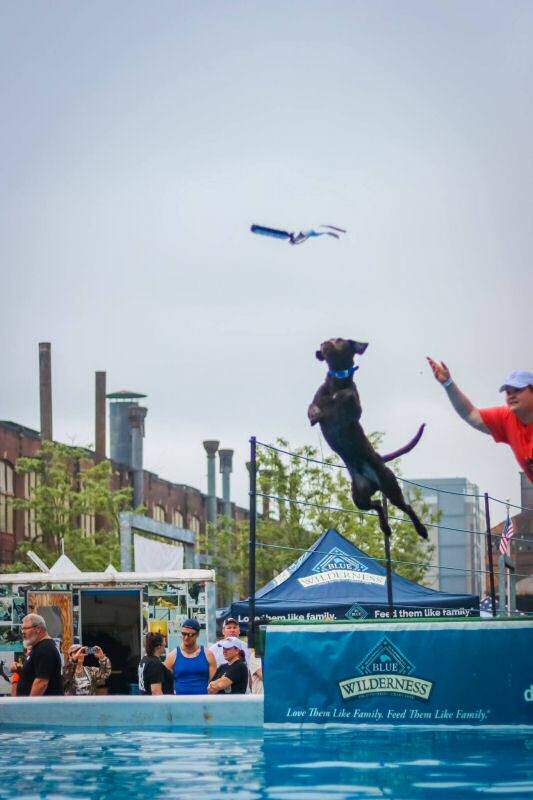 He has been invited to the 2017 World Championships in all disciplines (big air, speed retrieve, extreme vertical, and iron dog). Extreme Vertical (height jump) - 6'8"
Thank you for a wonderful dog! I have attached some recent pictures. 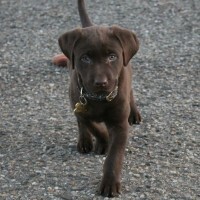 If you decide not to have more chocolate puppies, I will be sad because I will be looking for a new puppy soon! Hey Nancy and Levin - hope you are doing well. Below is a picture of River (on the right), the lone male from Hunter and Polly's litter of 7/26/2016. When I saw this picture, it reminded me of Polly's picture on your site so I included it below so you could see the side by side comparison and the remarkable resemblance. When he's got his serious face on, he looks just like his dad, too. He strikes a very regal pose at times. He's a headstrong and proud boy and I couldn't be more pleased with the amazing dog he's growing up to be. He's just full of himself and nothing slows him down. 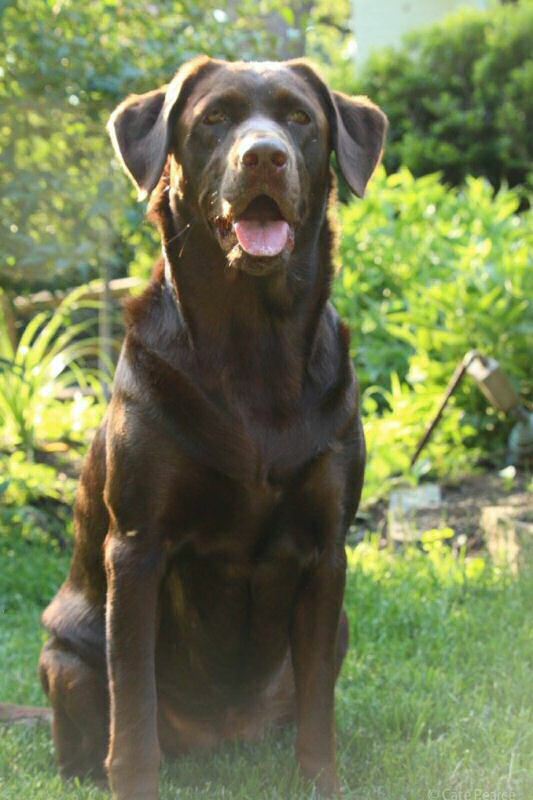 I look forward to many years with him and hope to add a companion for him in the near future...he surely needs another chocolate to run around with. Thank you for your conscientious breeding that gave me such a healthy and handsome pal! 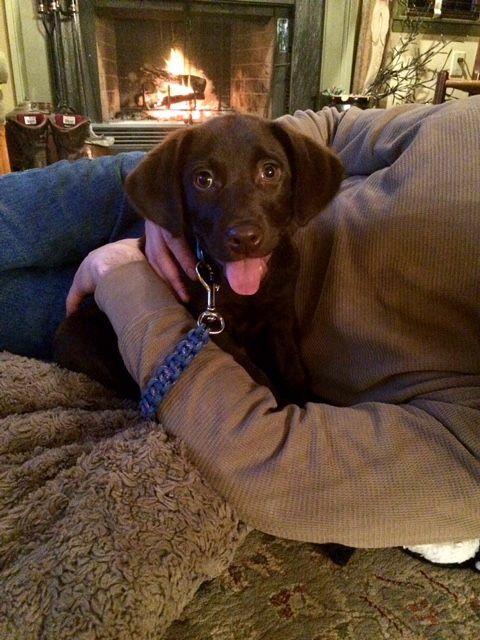 We wanted to send a note to let you know that our pup is doing very well and finding his place in our family. He?s learning fast and growing steadily. 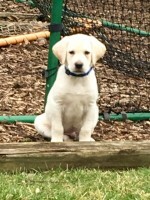 He?s already almost a pro at walking on the leash, loves to play fetch, and swimming in the kiddie pool with his toddler. 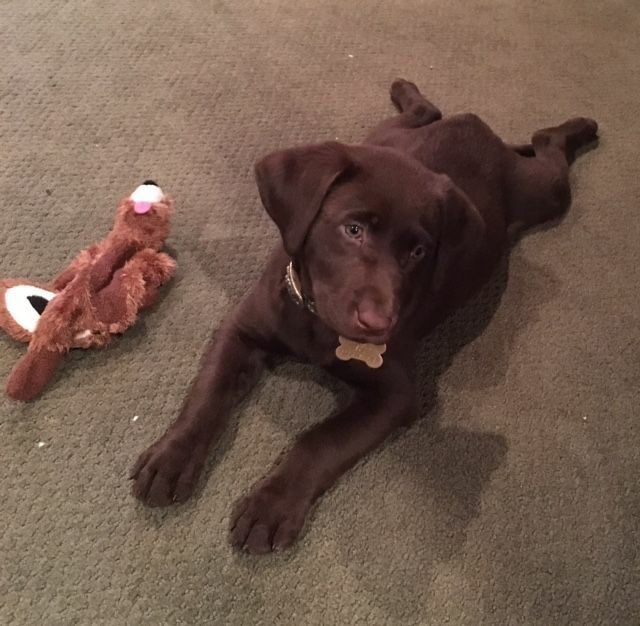 Reagan really wanted to name him Tail Doggie, but we compromised and named him Charlie Tail (Charlie for short). We hope you have a safe and enjoyable Independence Day! Thought you'd enjoy seeing our big girl. Hope all is well. Been wanting to send this email to you all for awhile now, just got around to it today. 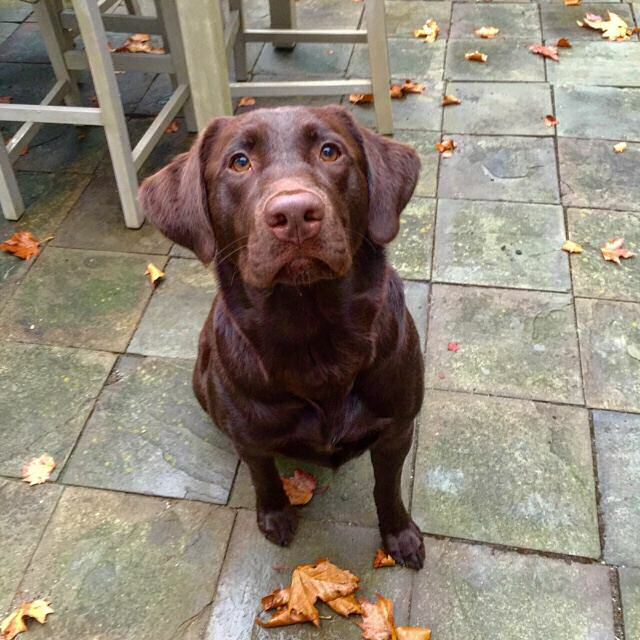 Bailey is my fifth Lab, first one bred by you guys. 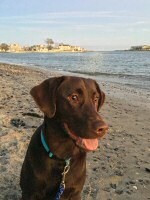 Having grown up on the Chesapeake Bay as a kid we have always had labs, but not like Bailey. She is without the finest dog I have ever had. Brains, beauty and athletic, what else could you ask for? Bailey will be four this July from the litter of Cocoa/Mick, she's definitely got her mom's ears. 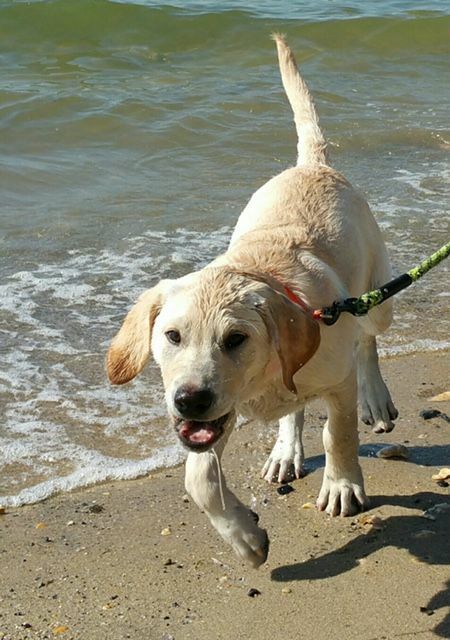 Friday is always our doggie/daddy day, with living in the Baltimore area we usually head to one of the State parks or Loch Raven reservoir to hike and of course to swim. The rest of the time she is with me at the shop, very few hours go by that are we not together. 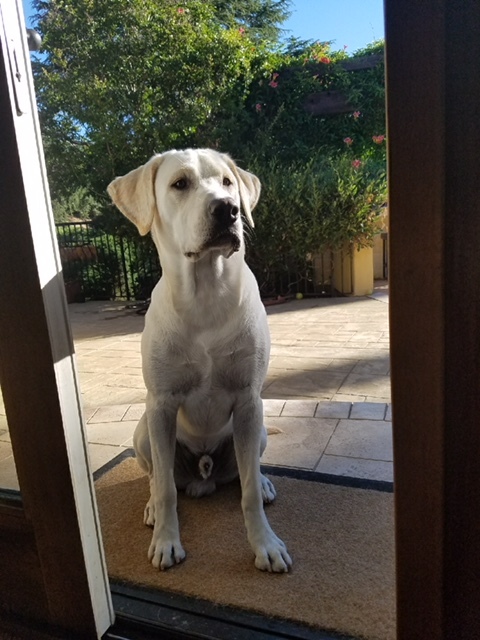 Funny thing, my wife is from Thailand and when she first moved to the US she could not understand why Americans let their dogs in the house. The Thai's love their dogs but they do not let them in the house. 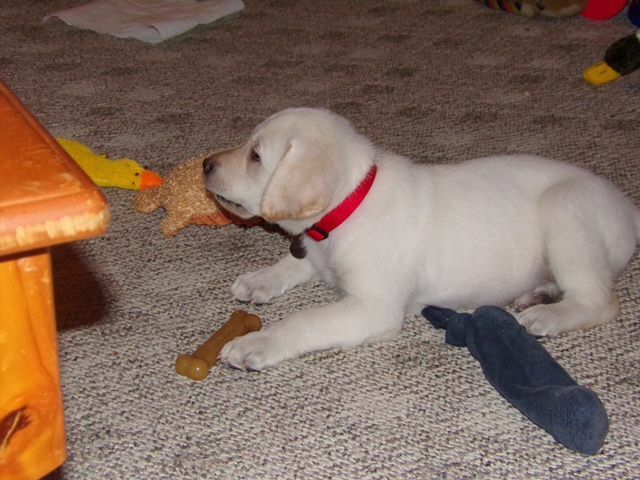 I have sent you several photo's of Bailey with one being the first day the two met. 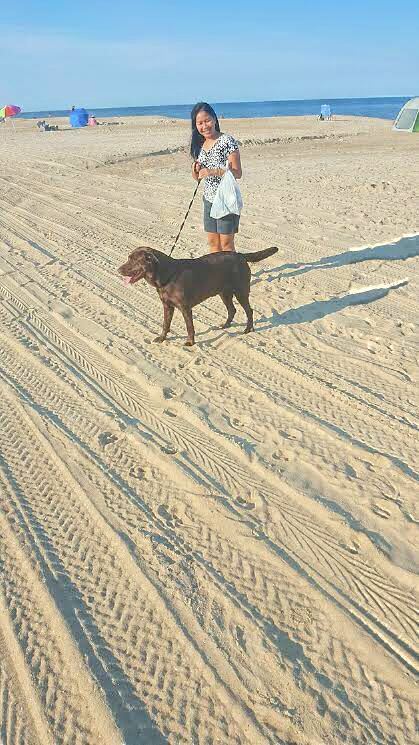 To make a long story short, my wife and Bailey are now best buddies. 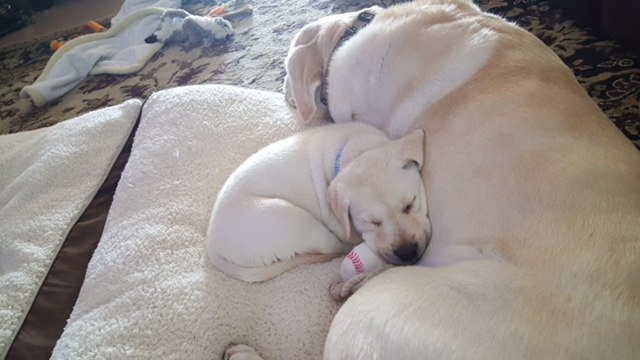 It took about two days for Bailey to win her heart now they are like two peas in a pod. Finding you guys was truly a blessing which we can never repay. Feel free to put the video on your webpage. We honestly discovered the hunt test game by accident. 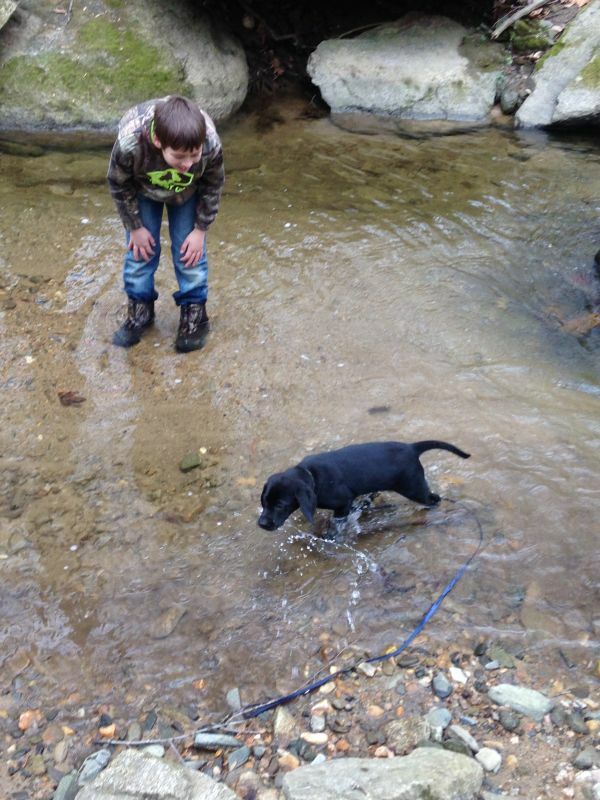 When we got Zeke we got him as a pet first and a hunting dog second. 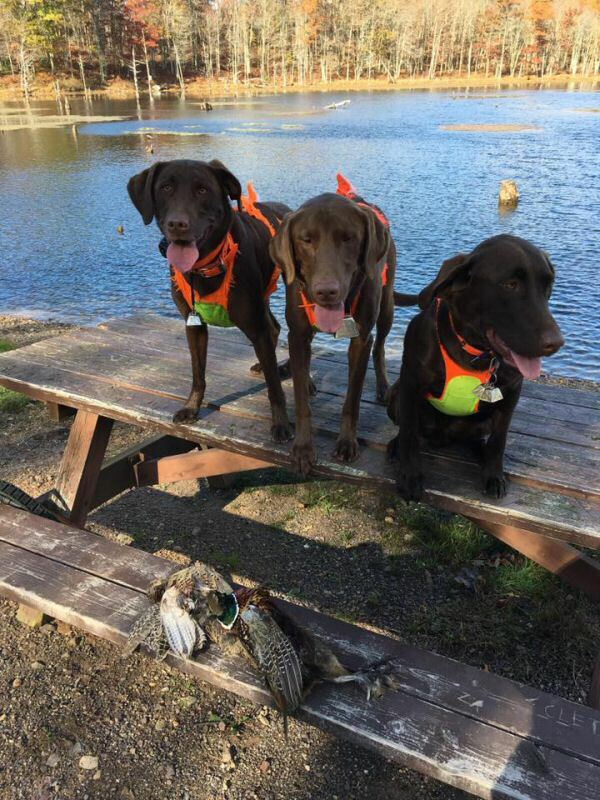 We joined a local retriever club and started attending their training days. The training days were focused on simulating hunt tests. At the time we said we did not need to run the hunt tests, but as we continued to train we decided to enter a Junior Hunt Test. We got a Junior Hunter Title and said we would continue as far as our ability to train and Zeke's ability (which is greater than ours) could go and most importantly the three of us were having fun. Well a little over two years after running that first Junior Test he got his Master Hunter Title and we continue to have fun! You are correct we have not sent Zeke to a professional trainer. We have read books, watched videos, went to the training days, and talked with people. We have had a lot of fun training and learning as we go. We continue to train and are working on more complex scenarios and continue to work on the basics. 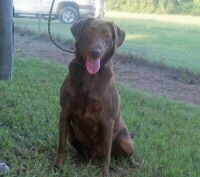 Zeke's breeding and genetics go along way to being able to accomplish what we have. He is a quick learner and wants to please. He has a great drive in the field, but settles back down when we get in the truck and is a big teddy bear when we get home. We definitely love him and thank you for what you have done to maintain the breed for what they were bred to do. Thanks so much for the video. If you don't mind, we'd like to put it up on our page. 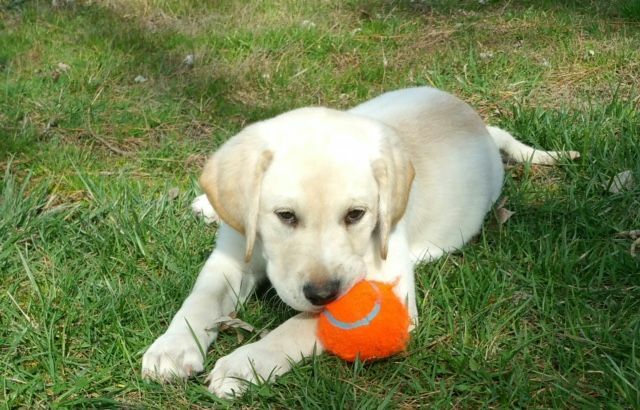 So many of our clients buy these dogs as companions without a clue what they are capable of with a little training. Also, it's a tribute to you and Sue on how well you've trained Zeke. When we were running dogs, we had the help and guidance of some of the best dog trainers in the country. I'm not sure you had that luxury, so I take my hat off to you for your commitment and perseverance. Here is a link to the video from this past weekend. It was at the Labrador Retriever Club of the Potomac Master Hunt Test. This is a video of the third series. It was a walk up with two marks thrown, after picking up the first mark you had to run a keyhole blind between two trees, pick up the second mark, then run a channel blind. 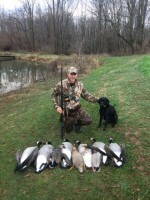 Zeke did well on the marks and the blinds. We hope that you are doing well! 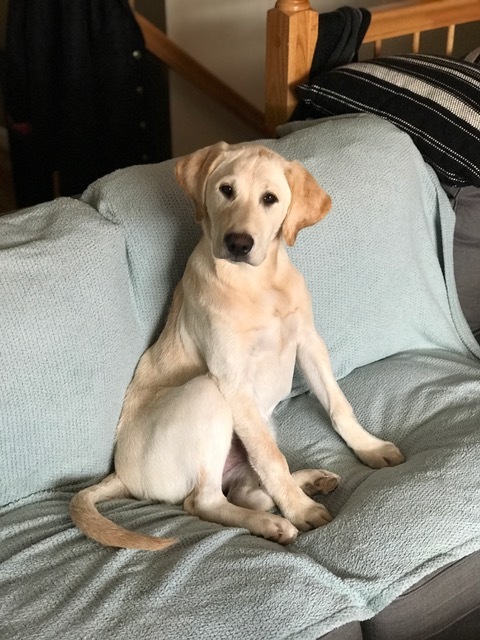 We wanted to let you know that our puppy, Ginger is doing well, she's growing quickly and she has become a wonderful addition to our family. 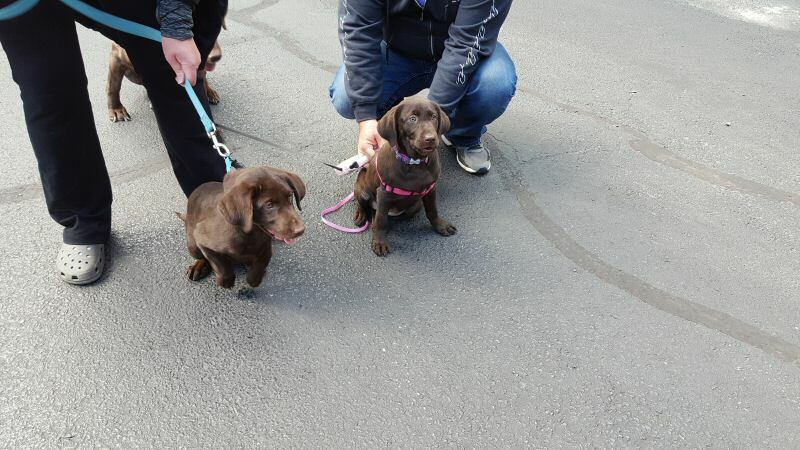 We had an amazing encounter over the weekend, when we were walking Ginger and our older chocolate Cinnamon in a campground where we have a seasonal site, a family stopped and asked us about Ginger and we discovered that they had a puppy from the same litter (Penny x Hunter), their puppy, Bella, was the last puppy. The sisters were so happy to see each other, we plan to get them together again soon! 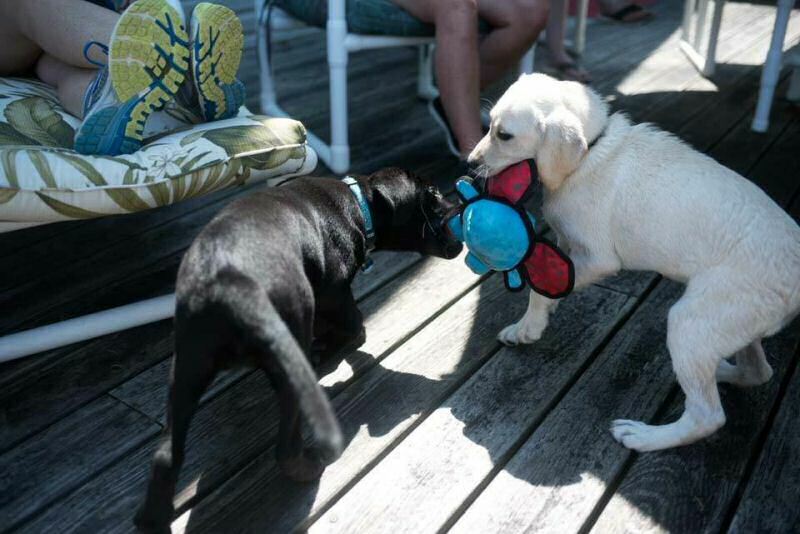 *Ginger is in the pink harness and Bella has the blue leash. It was great to see both of you on Saturday. I wanted to let you know that Zeke (Floyd x Sugar) passed the Master Test at the First State Retriever Club this weekend and earned his Master Hunter Title. He did a great job in all three series. His marking of falls was amazing. 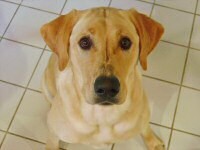 Zeke is out of a Floyd/Sugar litter in October 2012. Zeke is the first dog we have trained for the hunt test game. Sue and I have done all the training ourselves by joining a retriever club, talking with others, watching videos, and reading books. The fact that two amateurs that have never done this before have gone from our first Junior test to a Master Title in a little over two years is testament to the breeding of your litters. We really didn't start training for the hunt test game until he was about 2 years old. 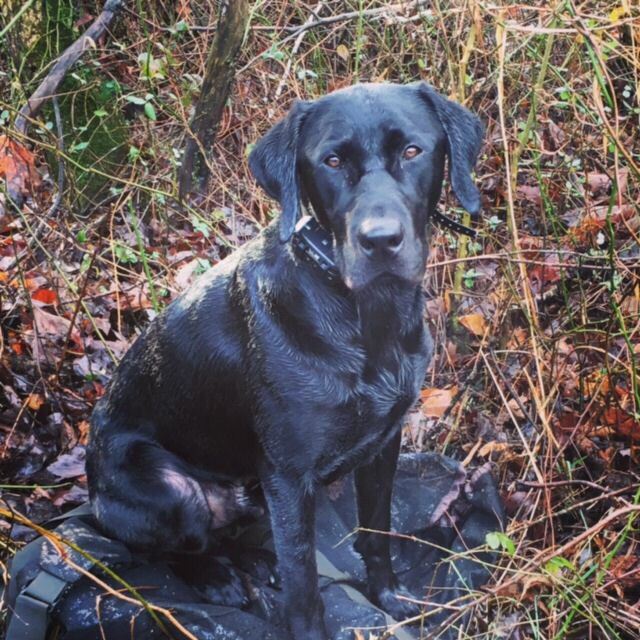 Zeke is a pleasure to train and great to be around whether at a test, in a hunting blind, or sitting on the couch. 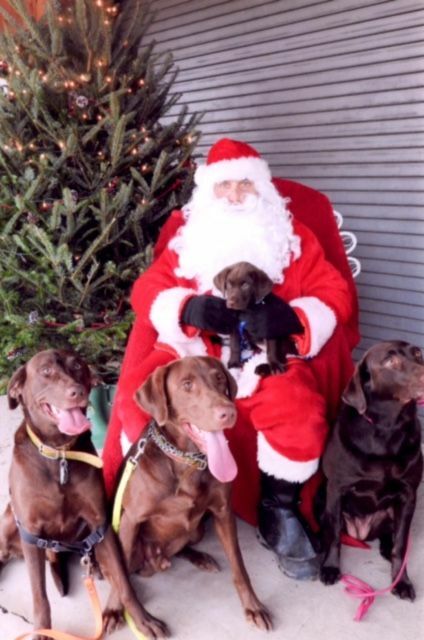 Thank you for breeding such great dogs! Hi Nancy --- we wanted to send a current picture of Roofus. He is 10 years old (2/28/07) now. Hard to believe all this time has gone by since we came to see you. 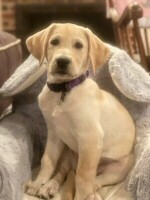 He is the son of Casey and Rosie. He is 86 pounds and the King of the house. He is the most loyal and lovable dog. He has been a big brother to a cat and guinea pig and they all love each other. Hope you are all doing well in Felton. 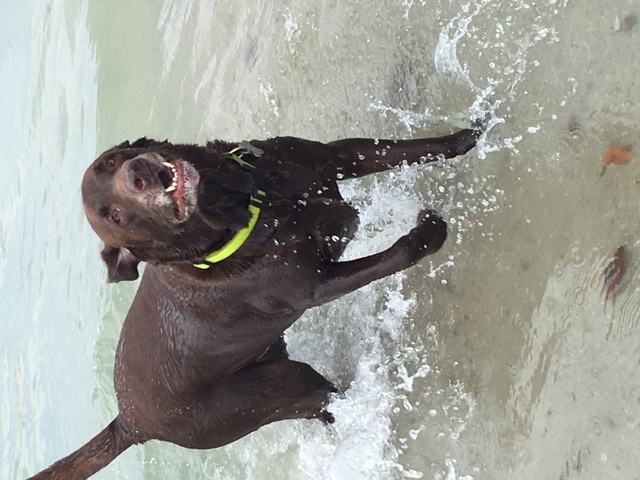 We know at least two other people who have purchased dogs from you and they are just as happy with their labs as we are with Roofus. 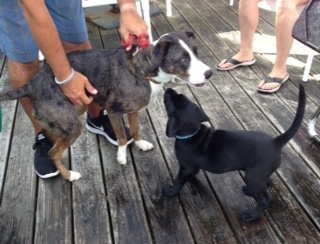 Hi Nancy - what a treat to see those adorable puppies and your grown up dogs too! You and Levin run a very kind, efficient breeding operation - you should feel very proud of what you are doing - we were thrilled to see it in action, and pleased to know that in a few months we will have our very own peachy pup! Thought you might like this picture of Willie?? (Missy and Tank, 2008) Willie will be 9yrs in 2/22?? he had his doctor appt. the other day and she is very happy with him. 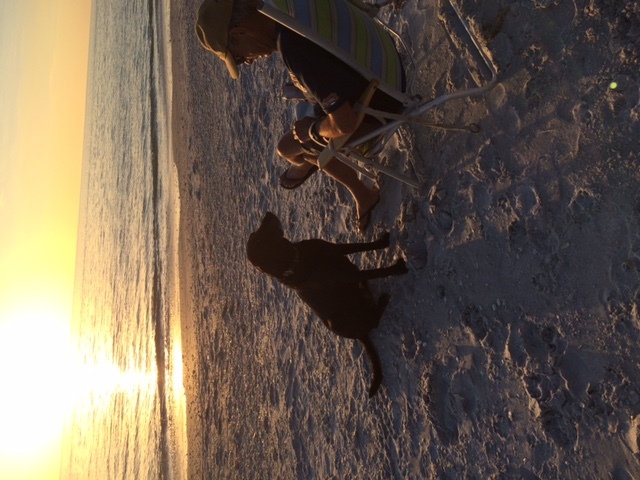 She said most labs at 95lbs at age 9 would be fat but he is solid muscle and a "stud". Just wanted to share this with you. You folks sure do know how to breed incredible dogs. This was his second duck hunt on the Eastern shore and he handled beautifully. 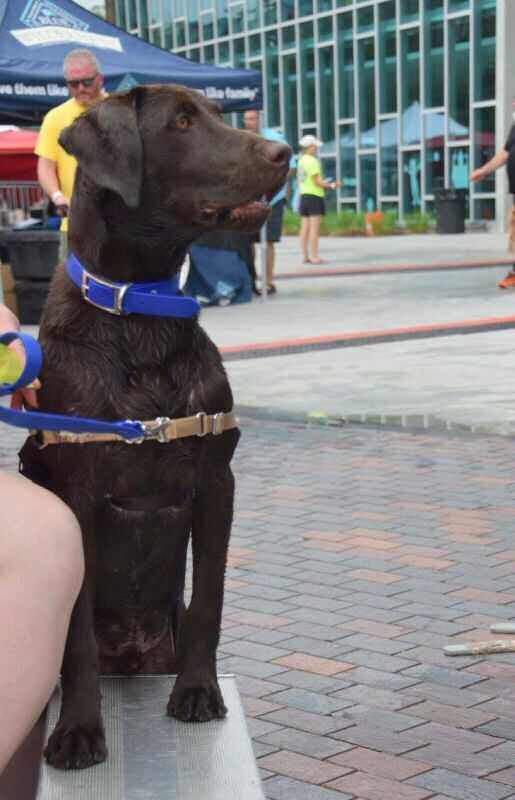 We get so many compliments on what a nice looking lab he is. Thank you again. Just wanted to update you on Cooper. 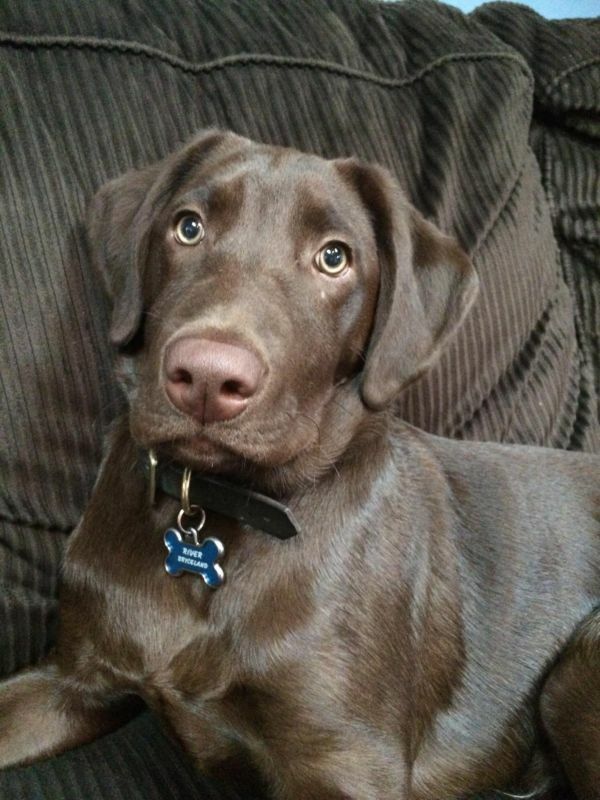 He is almost 6 months now and is doing great. He loves being outside and playing with his toys. We are so happy that we got him. He's the perfect addition to our family. 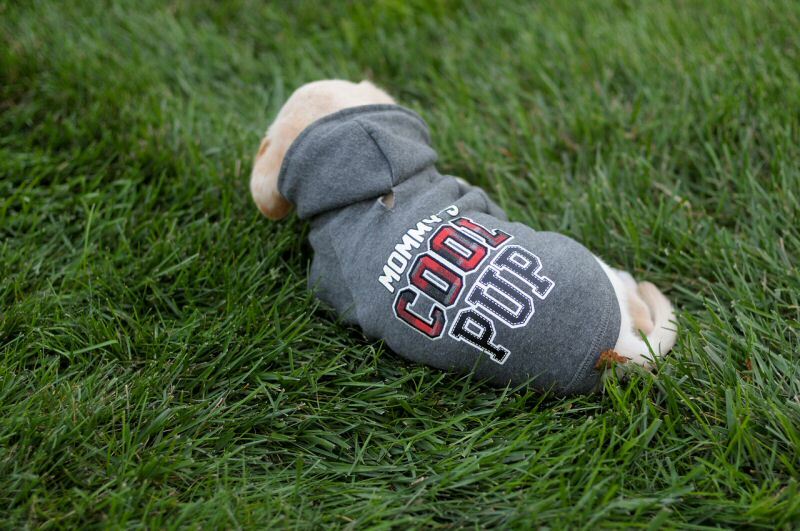 See Cooper picture 2. 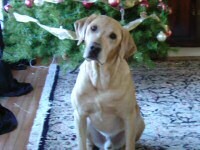 Today we put down Angel ... a yellow lab born of Rascal on Jan 16, 2001. She was 16 years of love and joy for us. Very active and high-spirited ... You told us that those traits could be trained out of her ... but we loved her because of her temperament or in spite of it ... not quite sure. She was wonderful and healthy till the very end. Thank you. Nancy, I wanted to share this photo of Jack and our cat. It's only taken 9 months to get to this point, but they are best friends. 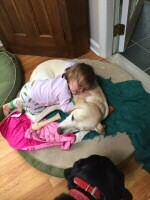 Jack is great with our cats and kids. It was a great pleasure speaking with you today after so many years. My wife and I cannot get over your great memory of us. I want you to know that our yellow lab, Simon left us this past Friday. He was the sweetest most loving creature I have ever come to know. Thank you for all that you do to raise such beautiful and loving dogs. Simon meant a great deal to our family. We still have a great deal of grieving to get through. His love will endure in our hearts forever. Here is a copy of my recent Facebook post about Simon. I have also included the photos we attached to the post. Thank you again for all that you do to bring these beautiful dogs to families like ours. Please give our regards to Levin. "I really do not know where to begin or how to express the loss and pain we feel over the loss of our best friend Simon. He was born on August 14, 2002 and joined our family that following October. This past Friday, November 25, 2016 brought much sadness and tears as we had to say goodbye. The precious time we shared passed way too fast. I will miss having you place your head on my chest while watching TV. I will miss the feel of your warm and silky head. I will miss your gentle wet kisses. I will miss the happiness I felt as you followed me around the house. I will miss hearing your cries when you fell and needed me to pick you up. I will miss you more than words can describe. You were truly the purest form of love and affection anyone could ever know. May God keep you close to Him. My sweet little boy . . . waiting until we can be together again." Hi Nancy/Levin hope all is well. 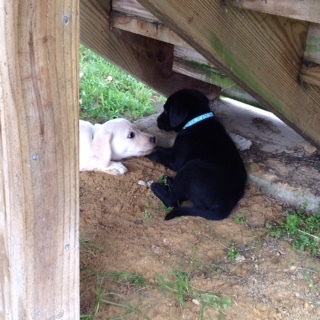 Couple of pics attached of little Magnolia(Maggie) getting along with her big brother River. She is doing great, potty trained, sleeping through the night and by 12 weeks! Although her brother River is just over a year now we can see how having a little sister will keep him young. They basically play all day and usually he sleeps when she sleeps... just like adults! Just wanted to send you a few photos of Charlie on her 1st birthday. She's doing very well and we all love her. She is very entertaining to have around. 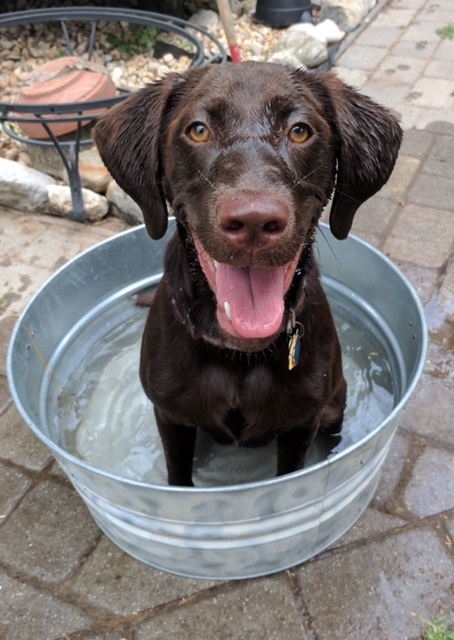 She learned that she was very capable of swimming this past summer and can't get enough of the water now, as you can see with the video she just dives right in. She is only 45-50 pounds but eats everything she is given. She loves the beaver dam food you recommended and we have been getting it at the local ace hardware. Thank you again for giving me such a great dog. Hi Nancy and Levin! I'm so sorry I just realized the email I had sent from my PHONE last Tuesday evening NEVER went out! I just found it in my OUTBOX on my phone! Which explains why you hadn't responded ... I thought that was a little strange since you had been so quick to respond to all other emails prior to us picking up Pebbles. Welll , basically it was just a quick one and a few pic's of our ride home and to let you know that she did GREAT on the long journey back to NY ... We were shocked at how quickly she adapted to the car. 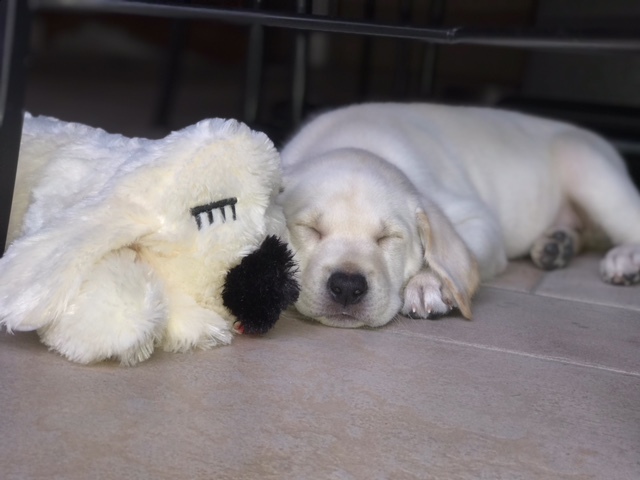 It was a rough few nights at first with her adjusting to our home and not having her siblings and Mommy around but she has come leaps and bounds in just a short week. 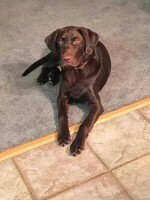 Yesterday we actually took her to a Lobster Bake at my husbands hunting camp about a mile north of us and she was amazing with all the people handling her and the other dogs that were there . It was just so wonderful to see how she's such a fantastic animal ALREADY ! We of course packed up her Pack and Play so she would be able to get her naps in (she loves her naps) lol So all had a great day. Okay I hope I haven't bored you to tears lol Just wanted to THANK YOU again for Blessing us with such a JOY !!! She has our hearts like we never thought possible in just a week. Thanks again and we'll pop in on you with updates I'm sure. Karl is doing fantastic. He passed his first vet appt with flying colors and was the calmest little guy during the appointment. He received plenty of attention from the entire staff. Addy is getting along with him really well and we couldn't be happier. The picture shows Karl starting to relax after playing in the kitchen with Addy. Subject: Home safe and Bailey (Mocha x Hunter) did great! Nancy & Levin, it was lovely meeting you in person. Please let us know if you are near Severna Park, would love to join you at Einstein's. 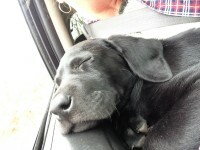 Bailey slept the whole car ride, did a little exploring and a quick pee. 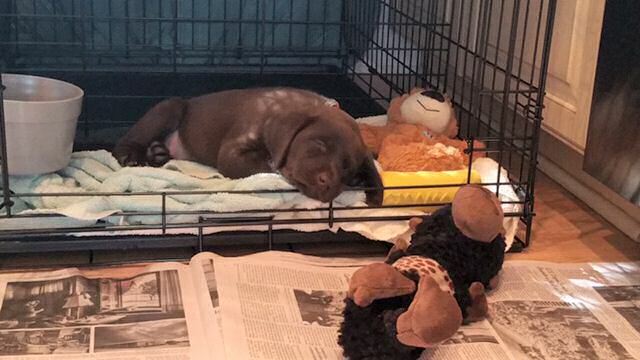 She went right into her crate, played with her toys, and went right back to sleep. 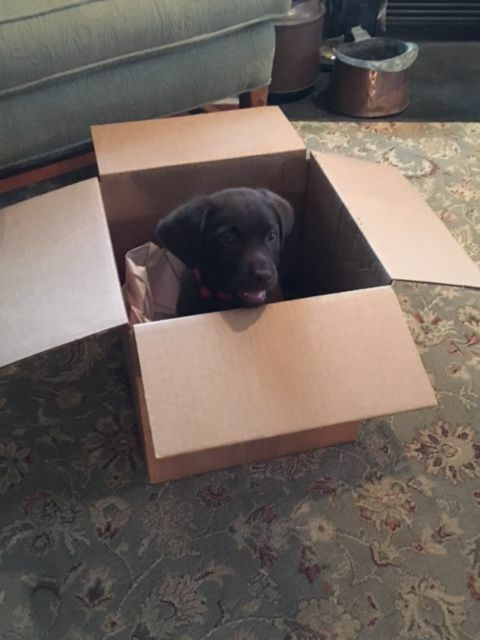 She seems very happy with her new crate. 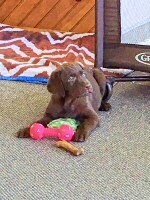 We are so very happy with our puppy from the Hunter/Seeker litter of May 2. 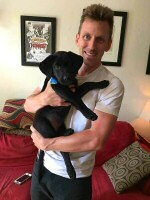 Our little black lab female puppy Rylee has stolen our hearts. 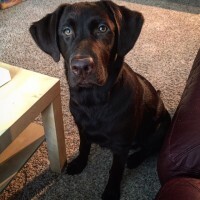 She is an amazingly good puppy with a calm disposition and sweet nature. She is 12 weeks old and weighed 22 pounds at her vet appointment today. I can?t believe how quickly she is growing. She loves the Beaverdam food. 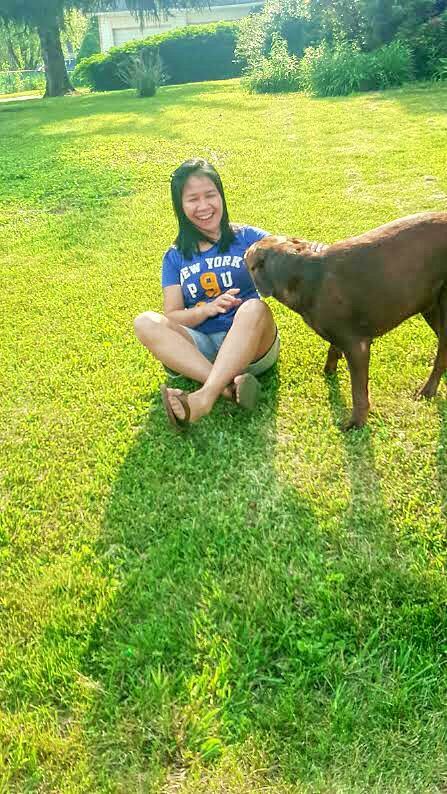 She is very well socialized having met our family members and friends and their children and dogs. 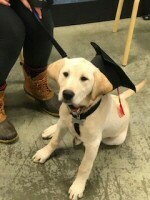 She has started puppy obedience class and she is very smart. I have attached some pictures. Sorry there are so many. I am sending a video of her first swim in a separate email. We just love her and are so blessed that we found you. We have had so much fun with her in the five weeks we have had her and look forward to many years of the same. 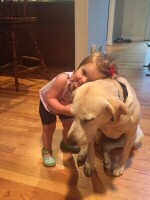 Rigley has brought so much love and JOY to our life! 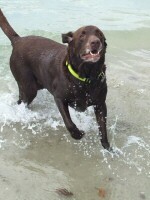 We think he might be part human... "Riggs" is everything that we could have asked for and more.... Some of his favorite activities include ... 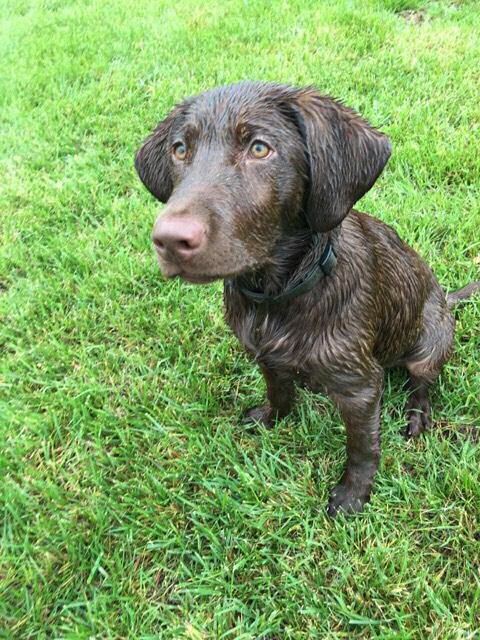 Swimming, digging, helping mom study, eating, riding in the car, playing with his puppy cousins, hanging out on the boat, fishing, people watching and watching the outdoors channel! Riggs also has a girlfriend named Penny who is just a few months younger than Riggs. Here are plenty of pictures of our handsome boy! Enjoy! Jeffrey Sparrow shared 'Tidewater Spring 2016 Master Water Blind.MOV' with you. These two are absolute Best friends! Here are some great pictures from the clients that adopted Trestle when she retired. I wanted to send a little update on Brew. 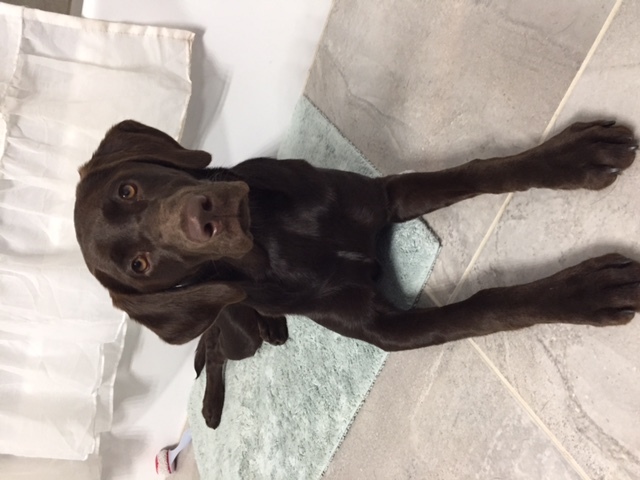 He is now 7 months old and is progressing nicely. 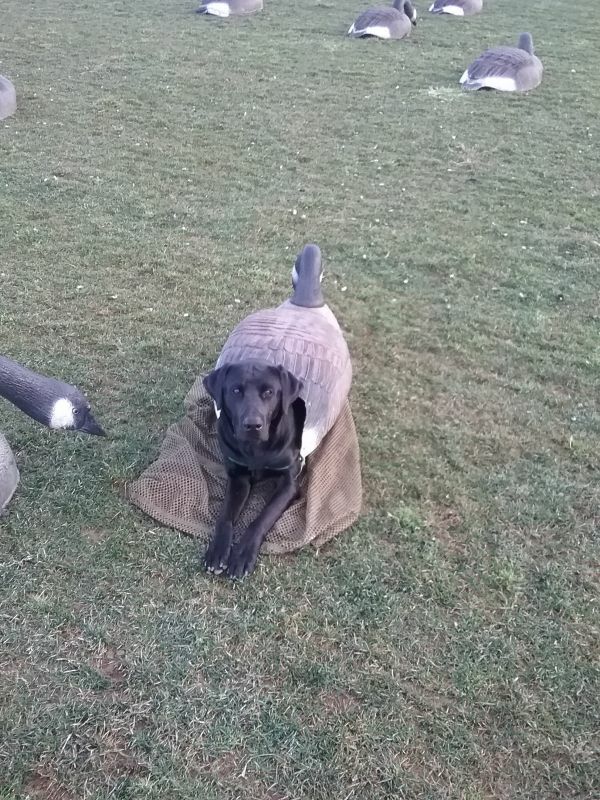 He spent a day in the field hunting pheasants and just competed in his first dock jumping event. 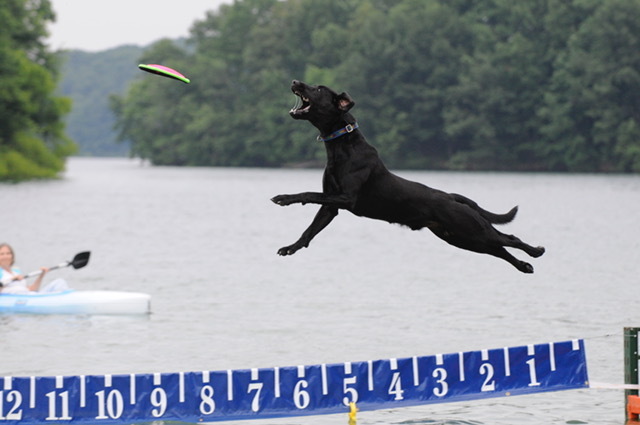 At 7 months old, he had an excellent sit-stay on the dock, had consistent jumps in the 17' range (PB of 18'6"), and placed 4th in Senior Division finals (jumps between 15' and 19'11). He is already addicted to dock jumping! 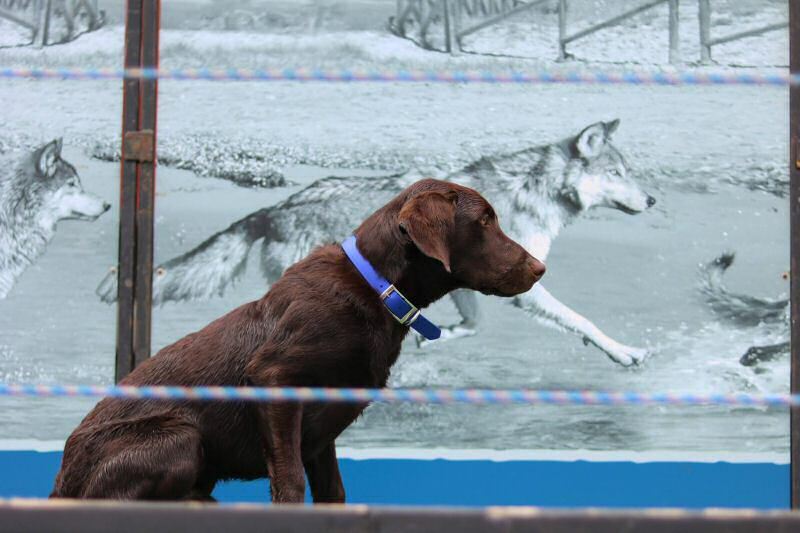 He intensely watched the other dogs on the dock. 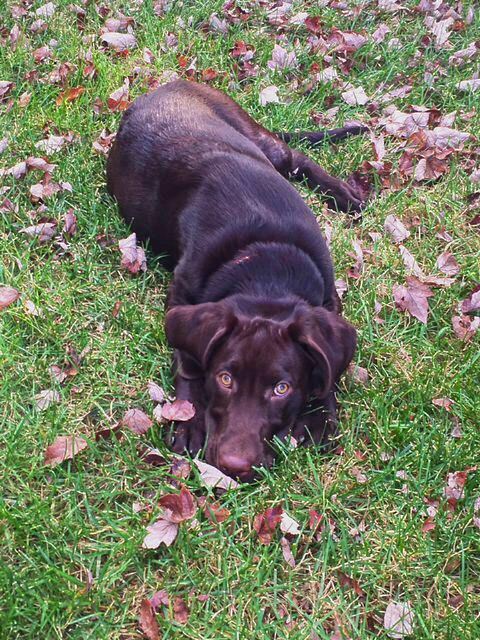 He has a little bit of a stubborn streak (but what 7 month old Lab doesn't? ), but he learns everything quickly. He is definitely high energy, high drive, but that is what I was looking for. I have attached a few recent pictures. 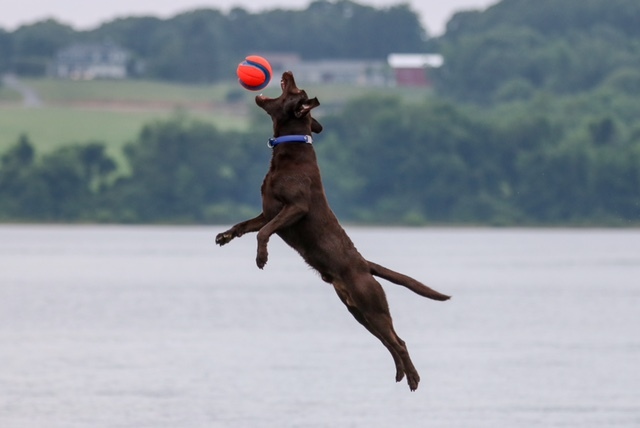 The first is of his sit-stay on the dock, second is one of him jumping, third is of him sitting in the stands watching other dogs jump, and the final is of him in the field. 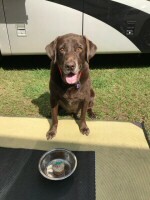 Thanks for such an awesome dog! Hello from LINCOLN (Poppi & Floyd male born 1/8/16). 4 months! Just love love love him! 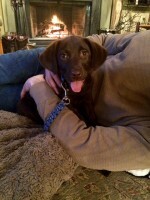 Tanger is settling in nicely with our family. The girls are just in love with him, as you can see from the attached picture! Hope all is well. Tillman is doing great :) 6-months old today! 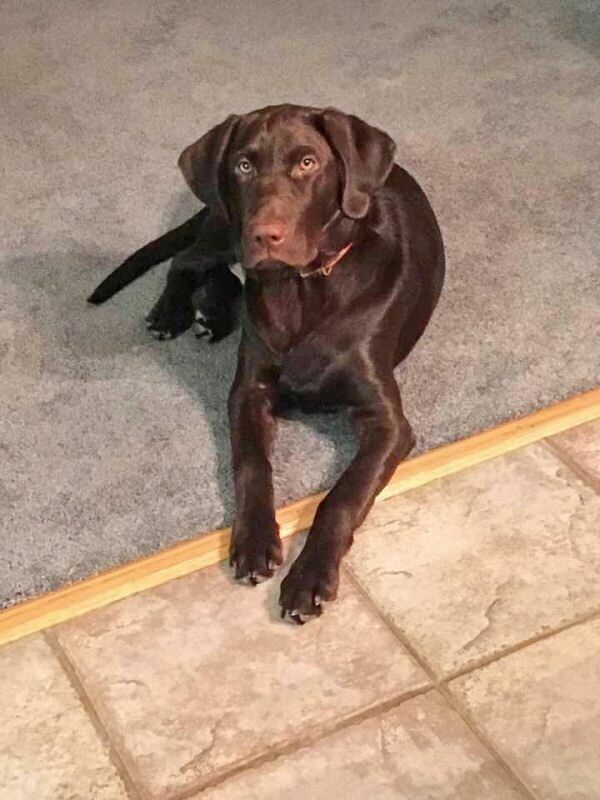 Lincoln G. at 3 months and 35 lbs! He is so much fun and such a good spirited boy! 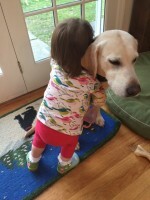 This first picture is Kit giving Trestle her 1000th hug of the day. And you may notice her sippy cup, which she is desperately trying to teach Trestle to drink from. It's a straw, so I don't think she'll be successful, but perhaps! 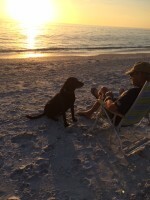 Trestle really is a wonderful dog and has been a great addition for all of us. Interestingly, the most interesting response is Chessie who has really welcomed her and the companionship has been great for her. 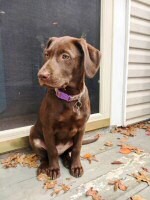 They are sweet to watch and Chessie respects her, protects her and loves playing with her. She even lets her take the tennis ball if they can only find one! I hope all is well in Delaware! Just letting you know Lincoln is doing great. 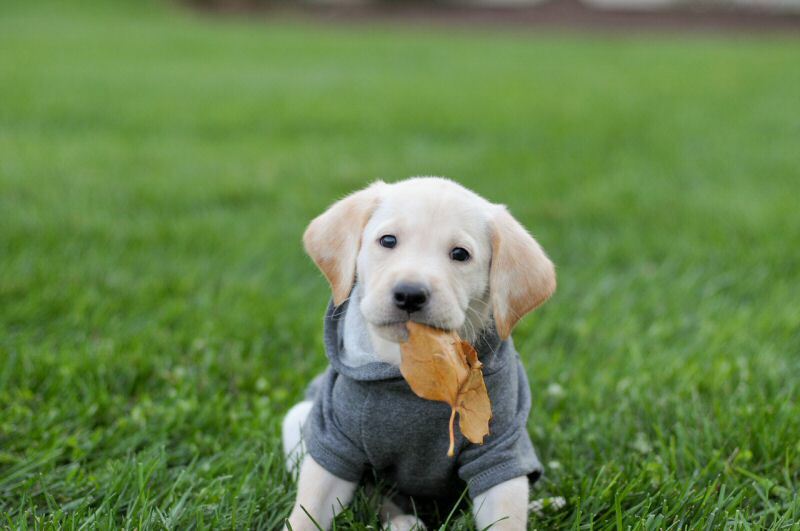 He can sit, stay, speak and goes out when needing to go. We are working on quiet and down. We just LOVE him! 22 LBS of Love! 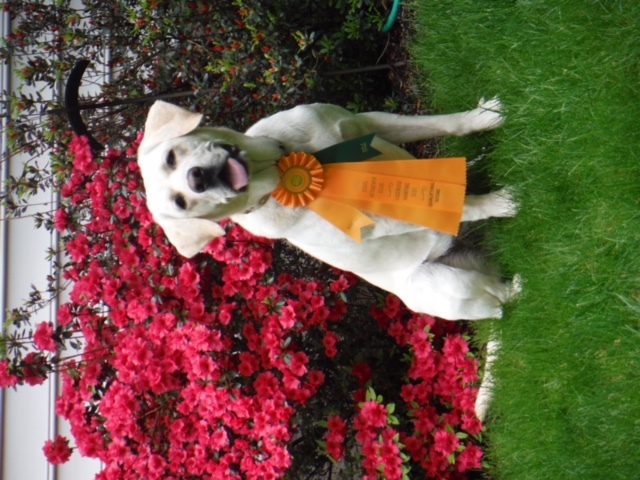 Thank you for breeding such a smart and wonderful Yellow Lab! Layla (Penny x Hunter) is doing great. She instantly became a member of our family. She is smart, loving and a lot of fun. 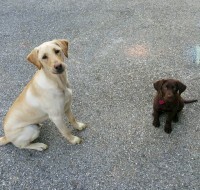 We wanted to share a pic of her at 11 weeks with her buddy Camo. 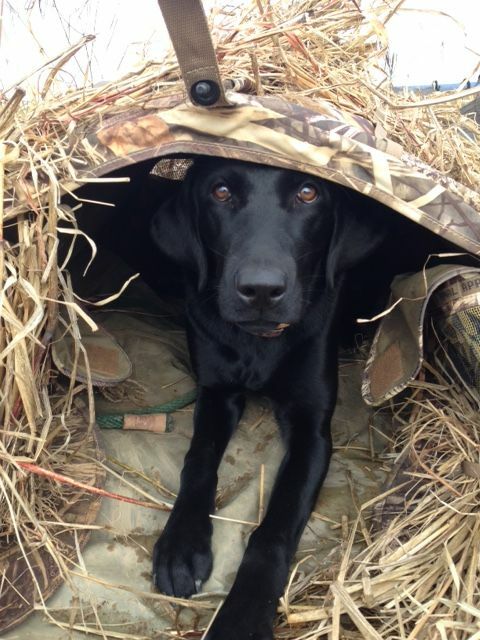 Camo is one of Floyds pups owned by our friends, Pat and Bri Flaherty. Here are photos I took this afternoon of Jack enjoying the nice weather. He is doing great! 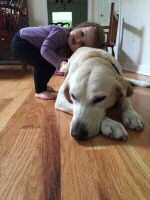 I wanted to send you an update on both my family's dog Taxi (Kezzi/Rocky '03) and Kevin and my dog Corby (Poppy/Floyd). Taxi has been the greatest family dog we could have asked for. 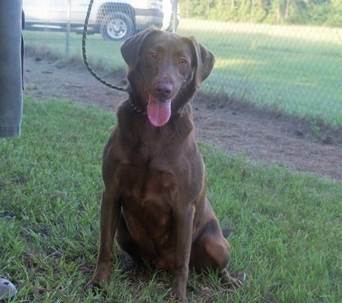 She is known around town for her friendly disposition and loves to eat, swim, and cuddle. 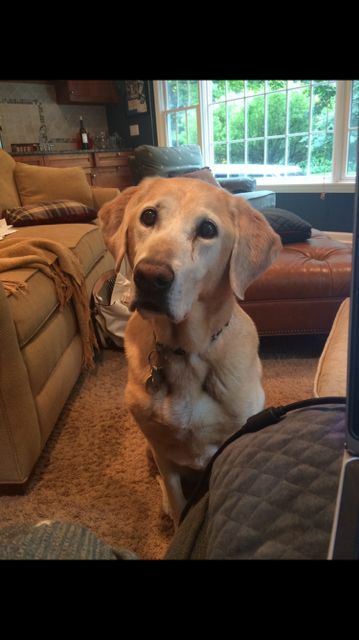 At 13, she is still doing well and is always loving. 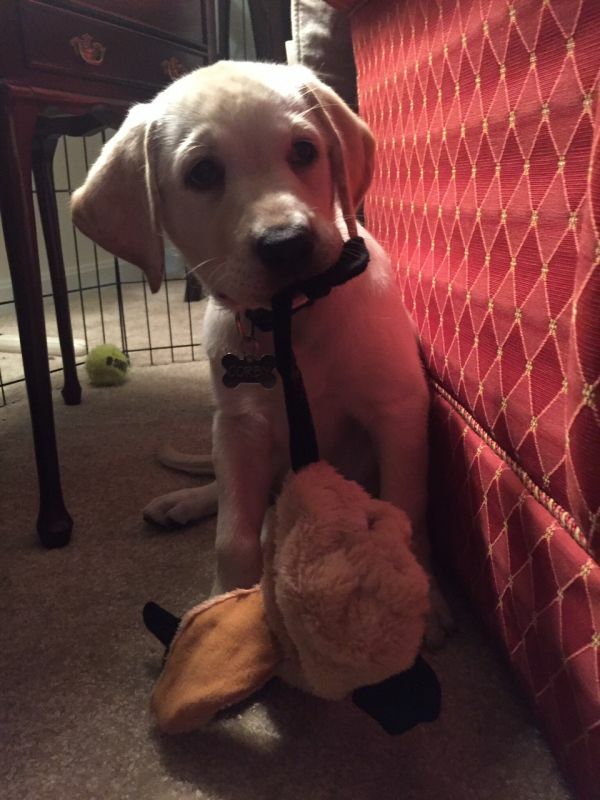 Corby has been settling in very nicely. 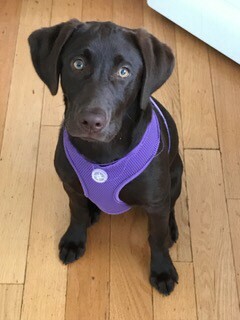 She immediately slept through the night and is doing well with her house-training. Everyone compliments us on her beautiful coat and she already loves everyone she meets. 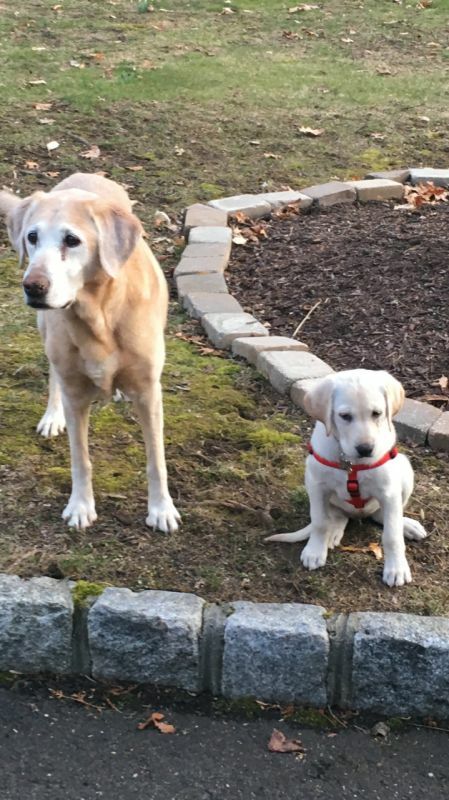 Taxi and Corby were able to meet for the first time this weekend and did so well with each other (Taxi even helped train Corby how to walk on a leash). I've attached a few pictures of them both! 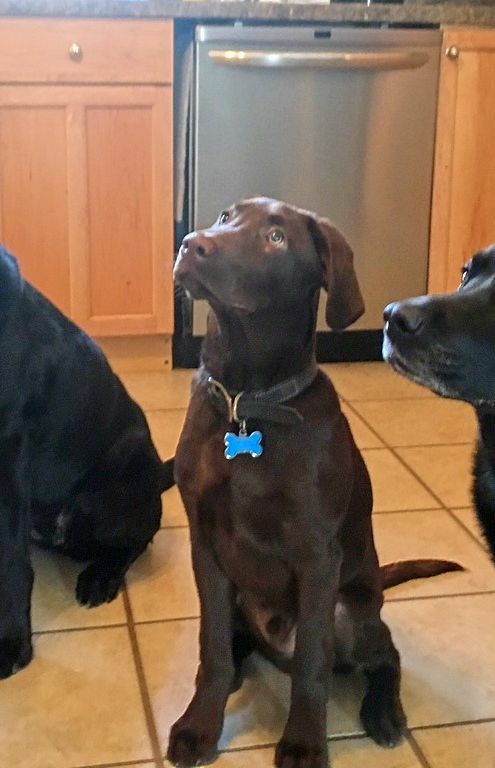 On behalf of my whole family, we can't thank you enough for breeding such loving, smart, good looking dogs. 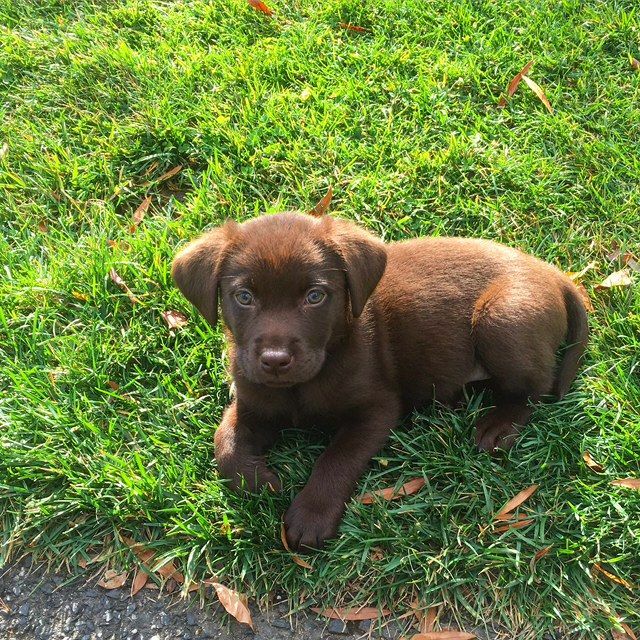 I just wanted to say hello and give you a quick update on my pup! I've named her Aspen, she's perfect. I think she looks like her parents, I get compliments EVERYWHERE I go! She had a great first vet visit a few weeks ago weighing in at 10.7 lbs and is already at 15 lbs since then. 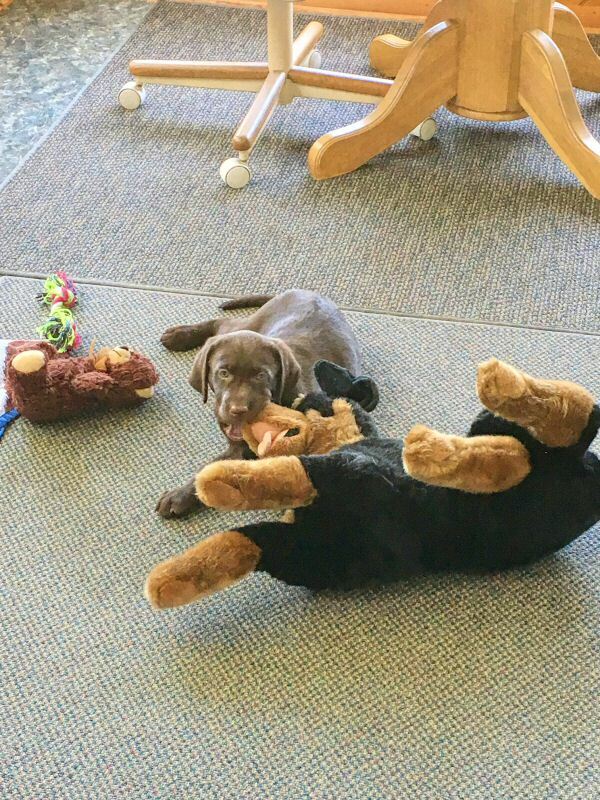 She certainly has an appetite... And we're working on diverting her teething to toys instead of shoes and people :) She started puppy training and already knows "sit", "down", "go potty", "come" and of course her name. It amazes me everyday how smart she is!! 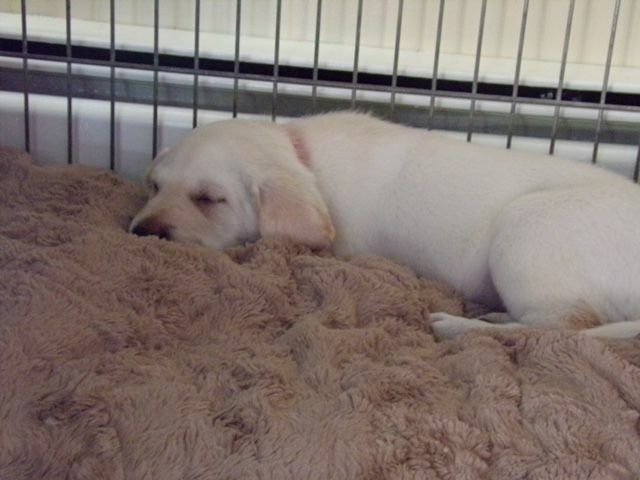 She's crate trained already and is on a routine, she's been sleeping through the night since the 2nd day I've had her. Aspen LOVES all people and dogs, no matter what age or size. It's amazing how well socialized she is, rarely bothered by any sounds or touches. She gets lots of homemade treats, fruits & veggies! Bananas and sweet potatoes are her favorite. Just a quick note to say thank you for breeding a great dog! Jake was a real "peach" (haha) on the way home, never whined or messed in his crate the entire 9 hours. He also accepted food, water and went potty every time we stopped. 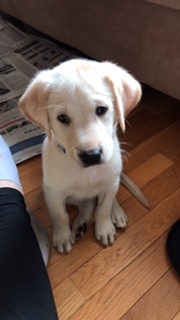 He is almost sleeping through the night and he has mastered "sit" and doing well with "come". He is also doing a tremendous job going potty outside. Thank you again, we adore him! Well, Tanger (Poppi & Floyd male born 1/8/16) is settling in. He is testing his limits constantly with malu but she has been very tolerant but stern! 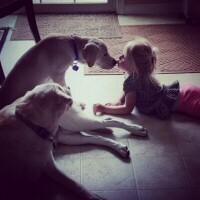 The girls love him and he is potty training well as he knows for the most part to go to the door when the time comes. Here is one of their many naps together. 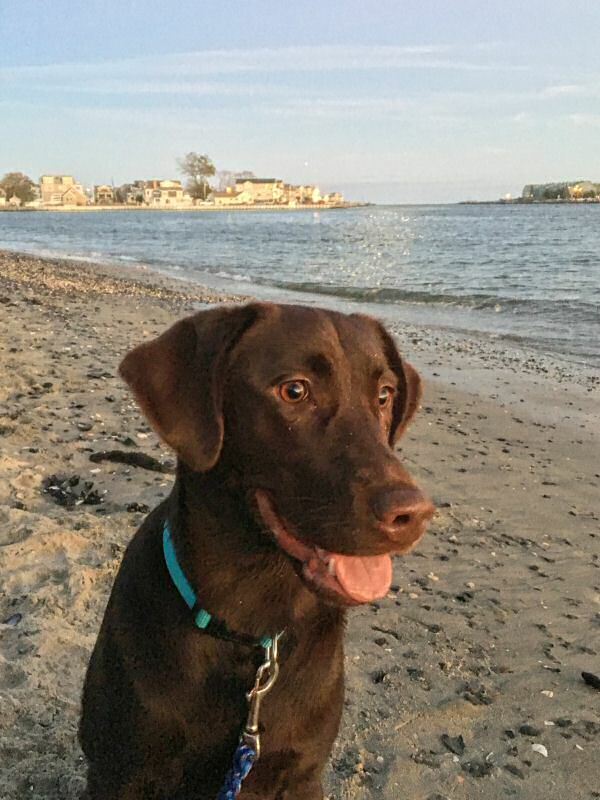 Good afternoon Nancy/Levin just wanted to drop a line and express our gratitude for such a wonderful lab...bouncy and happy! After going a year without our beloved old yellow lab, Keo, its seems like River is now filling our hearts back up! Another River picture. PS we may be looking to get River a brother but unfortunately we are unable to take him on until mid april...if one of the two males in Hunter/Penny litter does not get adopted do you hold on to them until someone does? Or is it the case that they will most certainly be adopted before then? He's living the life and best friends w the cat!! Oh and we've been to the vet twice, he's micro chipped and all up to date! 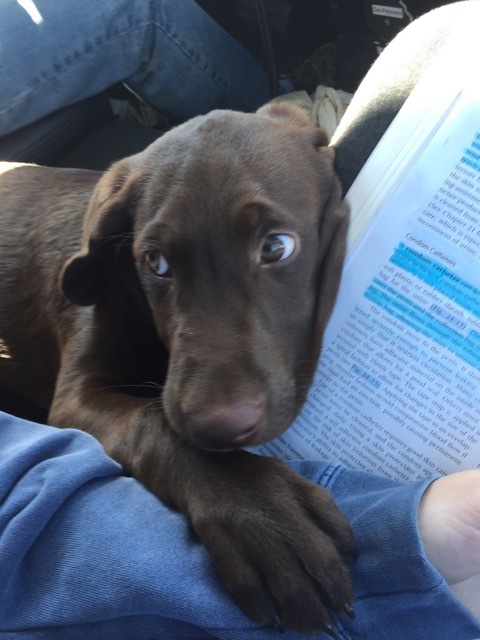 The vet said he's one of the nicest well bred labs she's seen in a long time! He's weighing in at 21 pounds! She said he's perfect. 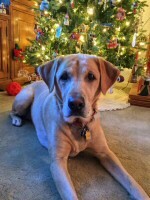 Now that the holidays have passed, I wanted to send you an update on Brew. He is adjusting well and learning fast. 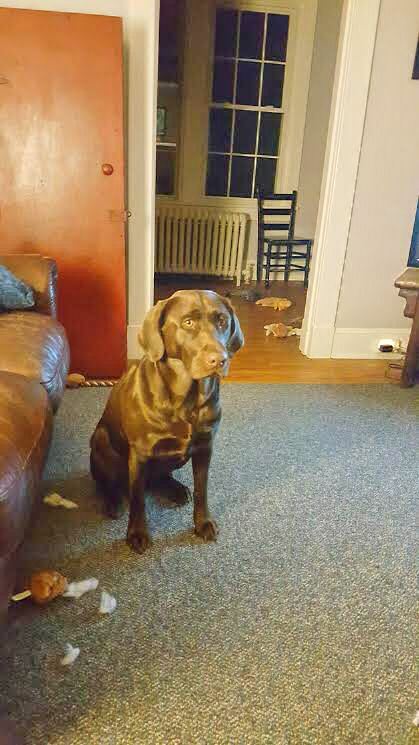 He fits right in with my other chocolate labs. 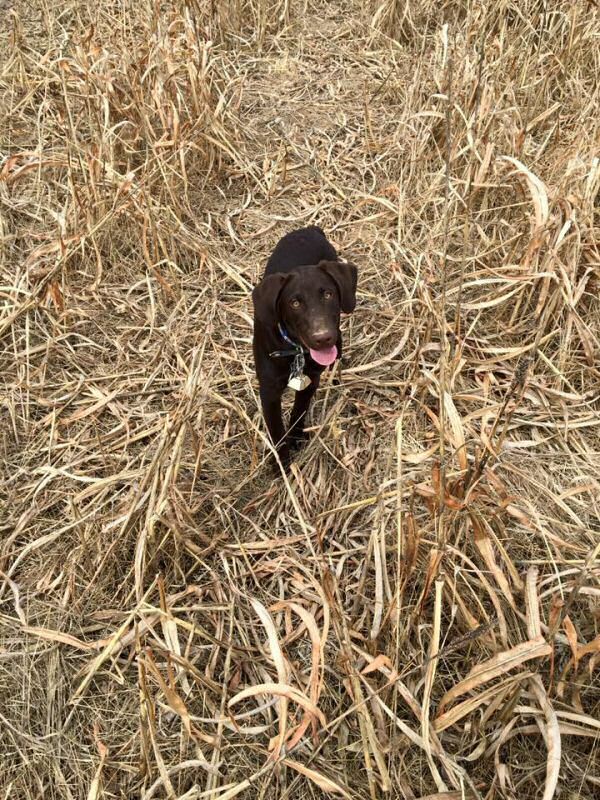 This past week I took the dogs to a pheasant preserve. Brew was in the car while we shot clay birds. He had no reaction to the gun fire. I showed him one of the pheasants and allowed him to fetch it. 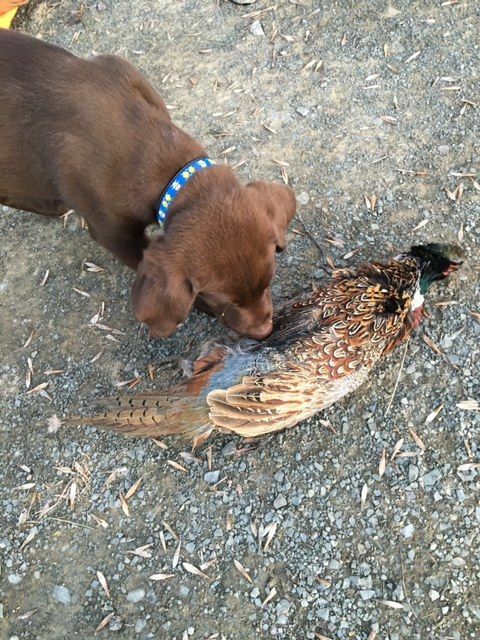 We bought him a chukar and worked with him. 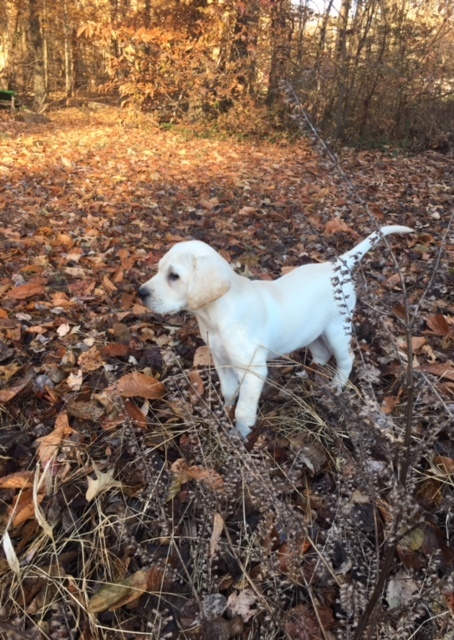 He is already scent tracking. I can't wait to see how he develops. I have attached a few pictures. The first is his Christmas picture with my other dogs and the second is Brew with a pheasant. 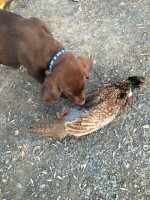 I also attached a video of him scent tracking with the chukar. Thanks again for a wonderful puppy! Doing what he loves most. Here are just some pictures of the last month from the first day we got her to last night. We love her so much and she is really being a great little girl. 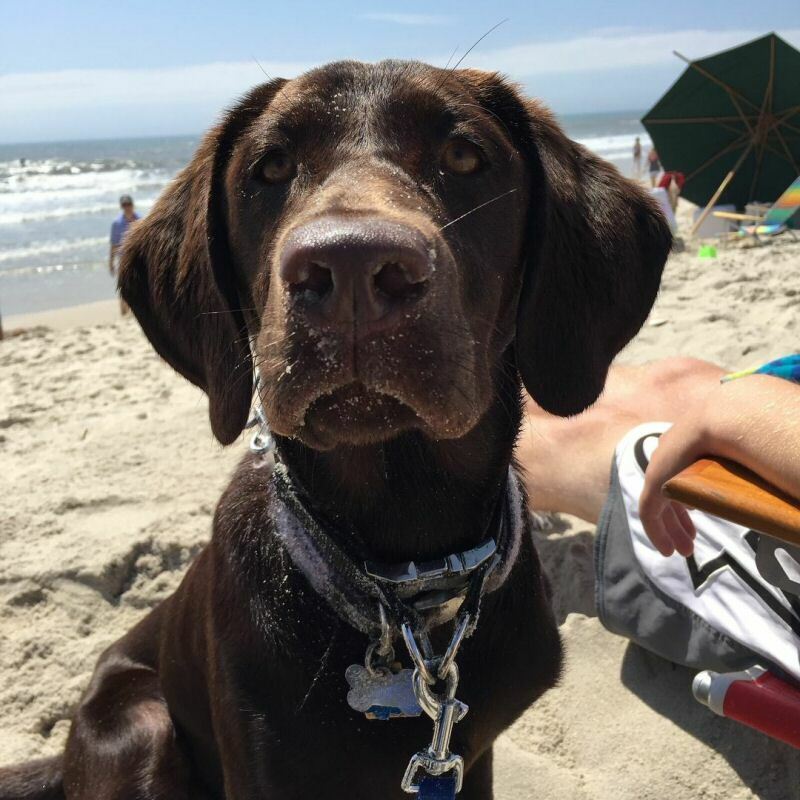 She loves the beach and can't wait to go swimming at the dog beach in the summer. She's drinks like a camel. She is still eating the 1.75 cups. Should I start giving her 2? But thank you so much for her she is going to be a great dog. It?s been a couple of years, and apologize for not sending you an update until now. 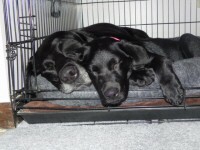 Bailey (5-yr) and Creena (4-yr) , Both from Sugar and Floyd litters, are doing great and going strong. 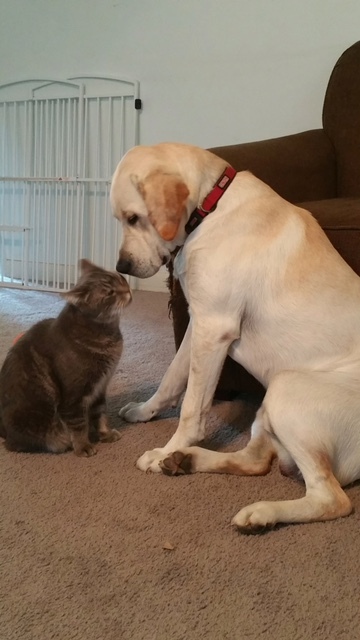 They have never met a person, dog or cat (we have 2) they didn?t want to meet or get to know. For the past 4 years we have taken them to the Outer banks where they have learned to body surf in the waves. They have become quite the celebrities. 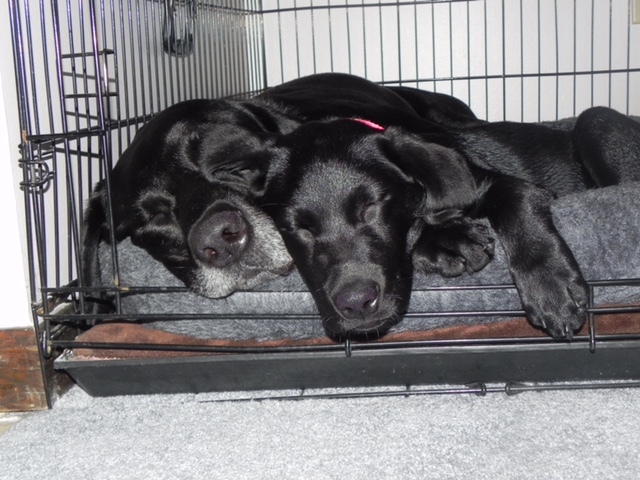 We keep thinking about adding another one of your great puppies to our family, but running out of room in our bed! 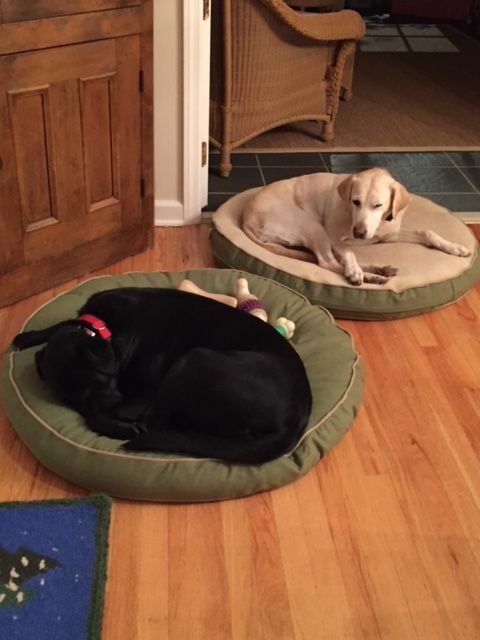 They always seem to start out in their dog beds, but considering their size 85 pounds each, sneak into our bed in the middle of the night. But, we never seem to mind. They are both so great with their vet, he wants to shoot a commercial so other people can see how much Bailey and Creena love their vet. 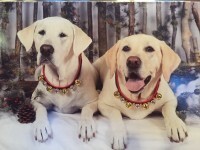 Attached is a Christmas picture from this year. 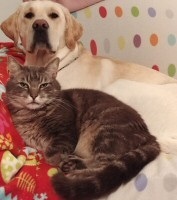 As you can see they both love having their picture taken. Thanks again for raising such wonderful dogs. They are such a great addition to our family. I just wanted to drop a quick note and picture to let you know that the boys continue to exceed my expectations We couldn't be happier with how the boys have turned out. They are the best companions, my life is so much better with them in it! Thanks again for breeding such quality dogs. 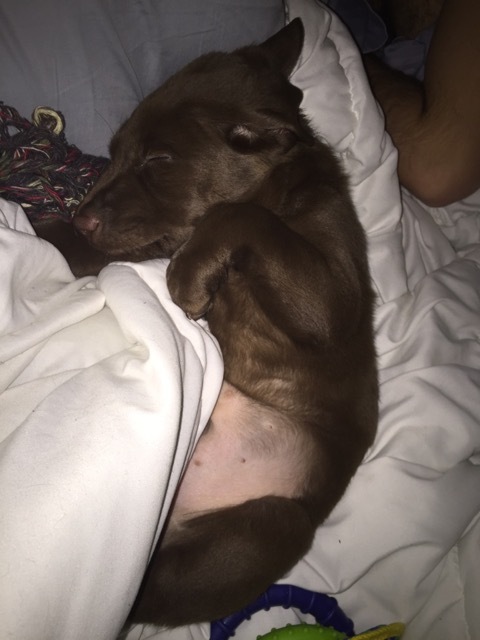 I got a lab chocolate puppy and his name is blue. He is very smart and loving. Not gun shy. 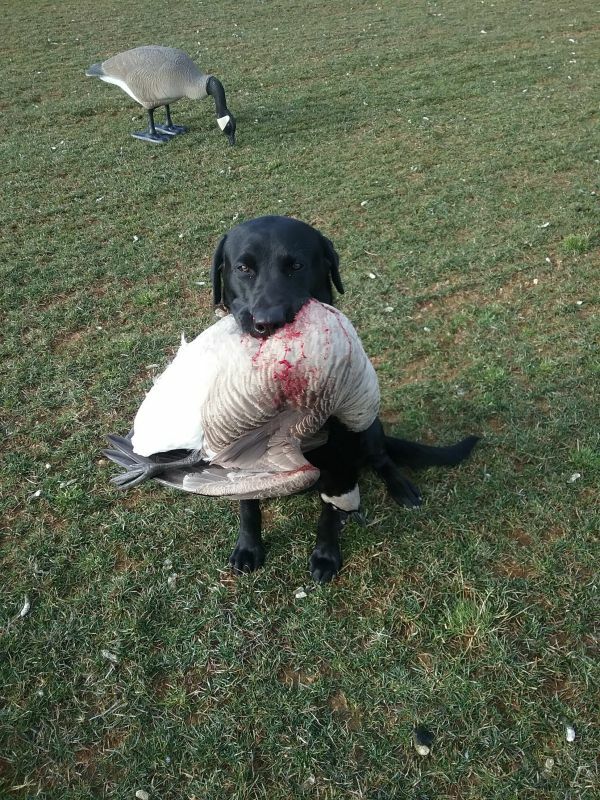 Retrieves great. The blood line is amazing and blue is very good looking. I am so proud of blue and your Web site is outstanding. Please share my email. Thanks so much for blue in my life. I wanted to pass along some pictures of "Jessie" on one of her first hunts this week. 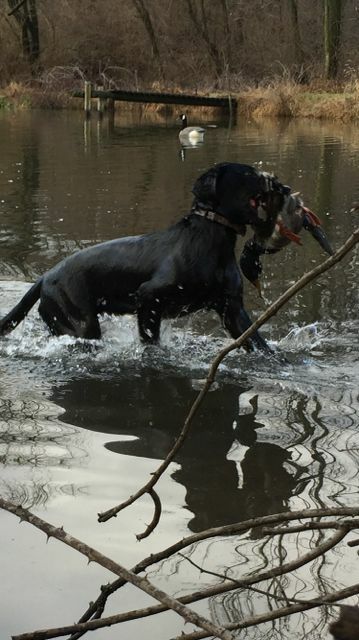 She's doing great and loves to retrieve! !